Fitness, Food and Photography | Follow me on my road to fitness… Because it's all about the journey, not the destination. 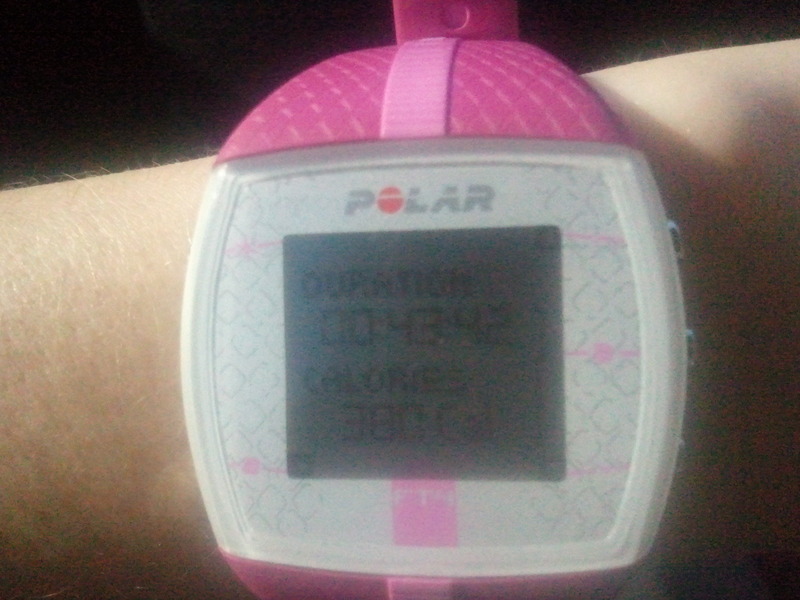 Follow me on my road to fitness… Because it's all about the journey, not the destination. 5 weeks ago, I said I was back. But apparently I lied. But it’s been hard trying to get used to the new schedule. I have to leave the house earlier so I can drive farther, park in a garage 3 blocks away and walk up to the 5th floor of the building. And leaving downtown at 5pm isn’t much easier. I’m not complaining though. Once I’m downtown, I really enjoy it. 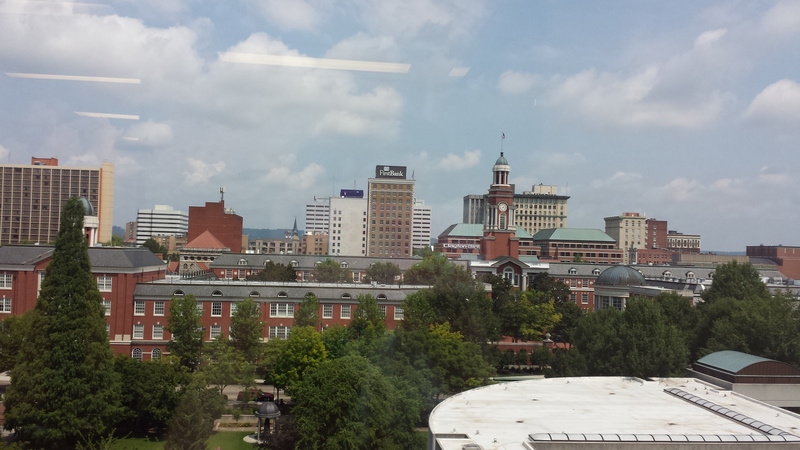 And how can I complain when this is the view from my new office? Yes, I said OFFICE!! For the first time ever in my career, I actually have an office. With a door and everything!! Yay! 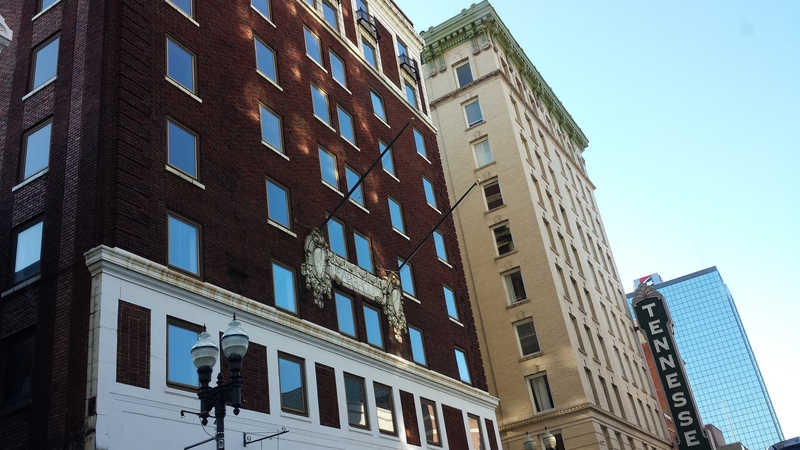 So far, my favorite thing to do is walk around and explore downtown during my lunch hour. 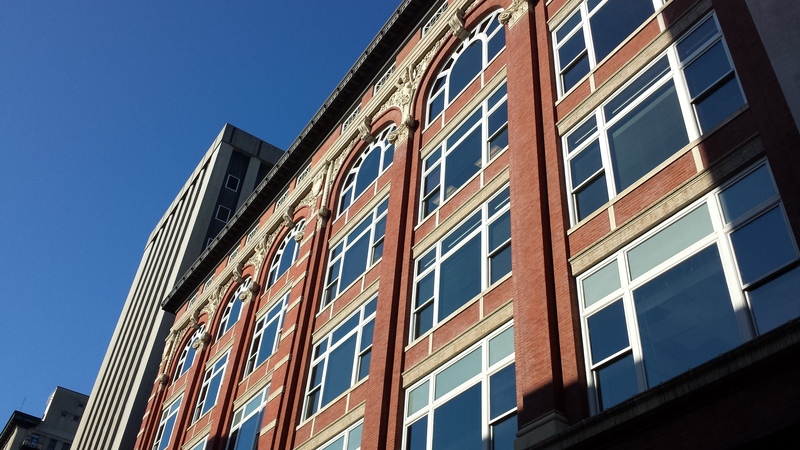 (If you follow me on Instagram, then you’ve already seen a few of these) …..
One thing I love about downtown is the architecture. 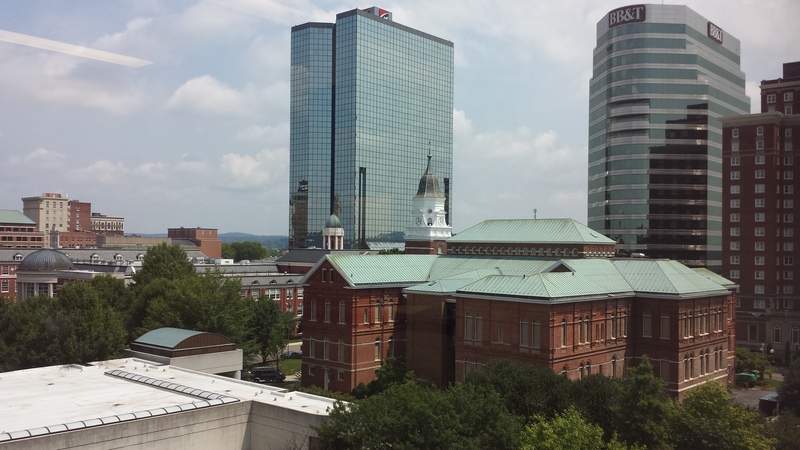 So many sights to see downtown. That’s just a few of the many photos I’ve taken. Hopefully this time I can actually be back for real. 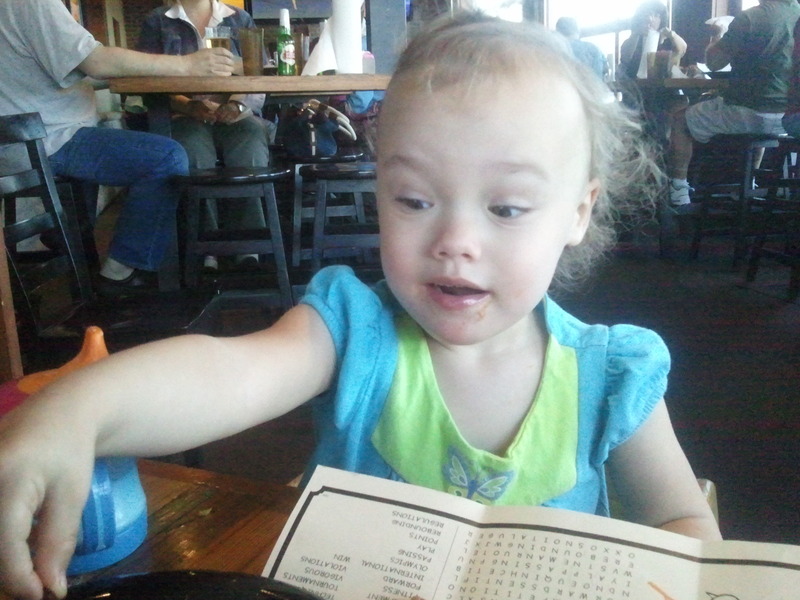 Tonight, we had grilled portabella mushrooms, but I forgot to take a picture of them. 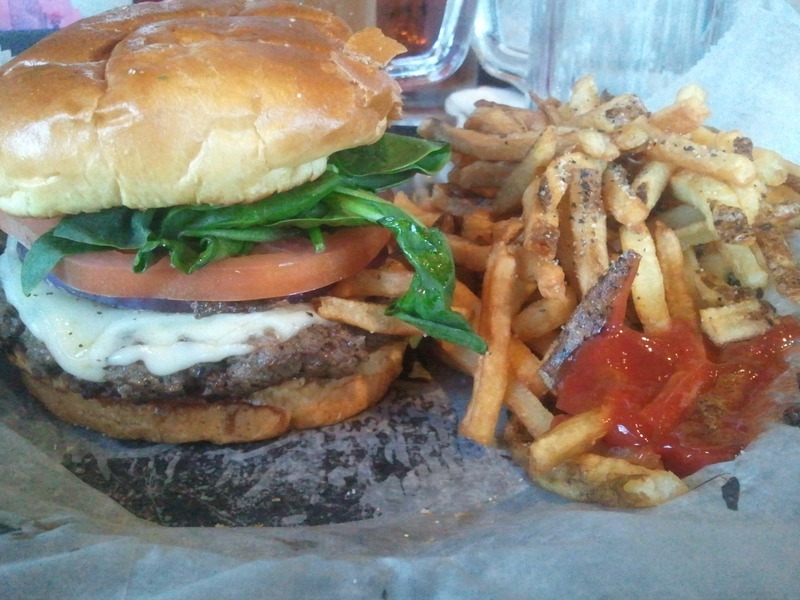 So instead, I’ll give you a picture of the turkey burger I had last night at Fuddrucker’s. We went there to celebrate hubby’s birthday with the family. This morning I actually got up early and worked out before work! (Yay me!) I’m so not a morning person. It usually takes me about 30 good minutes just to wake up after I’ve had a full cup of coffee. But today, despite the 150% humidity, I went for a walk/run in my neighborhood anyways, which ALSO included hill sprints!! It was awesome.. I had so much energy afterwards! 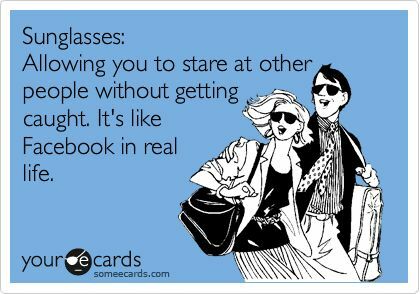 Who doesn’t love these funny e-cards? But how awesome is this ….. ?!?! 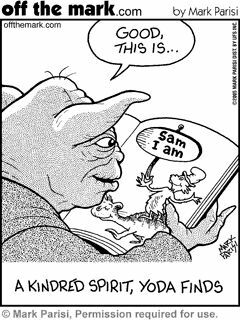 We read ‘Green Eggs and Ham’ on a regular basis in my house. My girl, Daisy, over at http://nomorefatkitty.com/ She is a super sweet, weight-lifting, dog-loving Aussie. I love reading her blog and her progress. Extreme Weight Loss. Chris Powell is hands-down my favorite trainer ever! Love him. He is so compassionate and motivational. 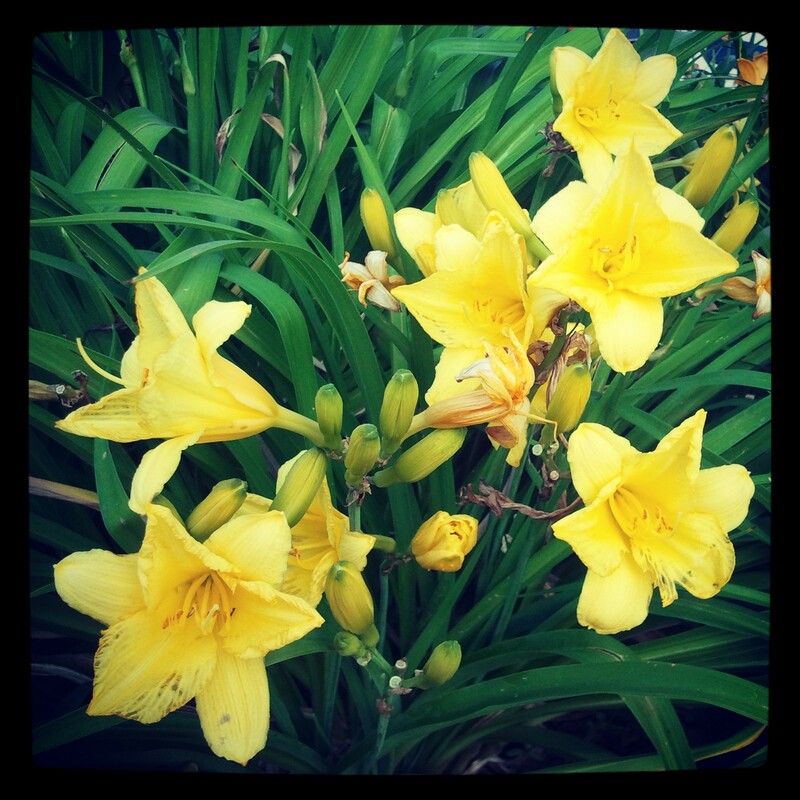 Daylilies are my second favorite flower (behind daisies of course). I just wish they stuck around a little longer than they do. I’m Back! 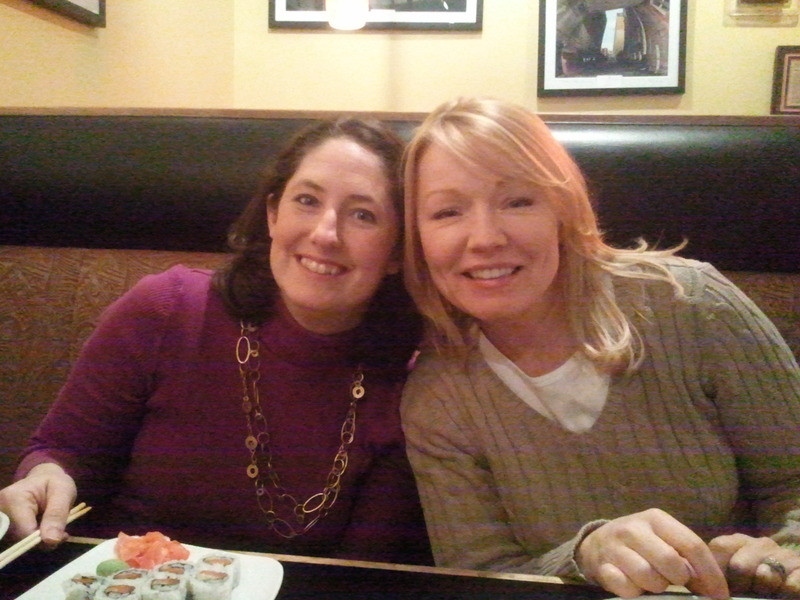 … And Happy 1st Blogiversary! Hello everyone!! I’m back! I’ve missed you all. How are you doing?? (I got out of the habit of updating the blog, so the last couple of weeks I’ve been procrastinating in writing this post. Instead I’ve been enjoying all the things I’ve neglected over the last semester.) I have so much to catch you up on!! So you’ve probably wondered what I’ve been up to while MIA from the Blog. Well…I’ve been busy, that’s for sure!! I’ve been taking 8 hours of online college credit courses with Barton Community College: Anatomy & Physiology I & II. And I made 2 A’s!!! What up! They have an excellent online program that I would highly recommend to anyone who needs to get college credit from an accredited school. The great thing about this Community College is that it feeds right into Kansas State University. Why do I care about Kansas State you ask? It has the only online Dietetics program that’s accredited by ACEND. You see, I thought I wanted to be a Registered Dietitian. (I still do). So I was taking the pre-requisite courses to help get me into the program. While I already have my Bachelor’s Degree in Business, I was prepared to go back to school to get a new degree. But I quickly found out that having a husband, two kids, a full time job AND taking classes was a bit much. More than a little overwhelming. I’m not completely giving up my dream of being a R.D. just yet. But for now, while my kids are little, I don’t want to spend all my extra time studying. I want to enjoy my kids. So I’m going to put this on hold while I pursue other things. Oh, and on top of those 2 classes, I was also studying for my ACE Fitness Personal Trainer certification. I ordered the books back in December and I had 6 months to take the test. I may have procrastinated a little in the first few months, but I hit the books hard for the last 3 or 4. It was a TON of information! There’s a reason they give you 6 months. You need it!!! It was a hard, hard test. But I am happy to report that I passed !! 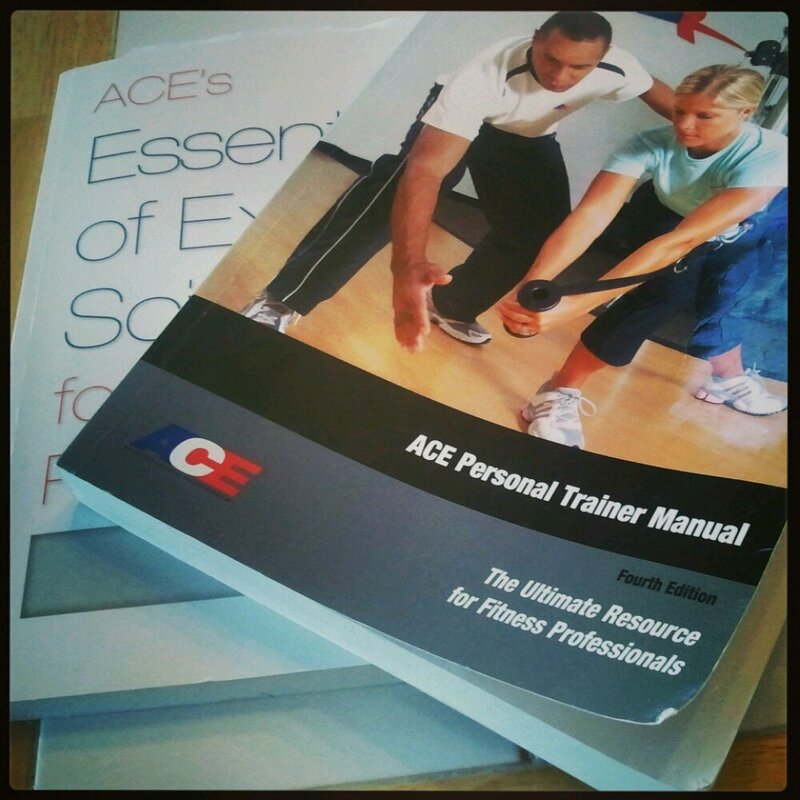 I am officially an ACE certified Personal Trainer!! Now the question is … what exactly am I going to do with that? I don’t know for sure. I’d love to take on a few clients on the side, just for fun. I love motivating people. But actually, I got the PT cert in order to get the Health Coach certification. Ultimately, I would love to be a Health Coach. So we’ll see what life has in store. Also, I didn’t want to miss out on celebrating my One-Year Blogiversary. I started this blog a year ago as a way to keep myself motivated. (Read my first post here). Even though I enjoy motivating others, I still need help motivating myself sometimes. I have the same vices as anyone else – beer/wine and ice cream! I think it’s okay to indulge once in a while as long as you eat healthy the other 90% of the time. I love food. 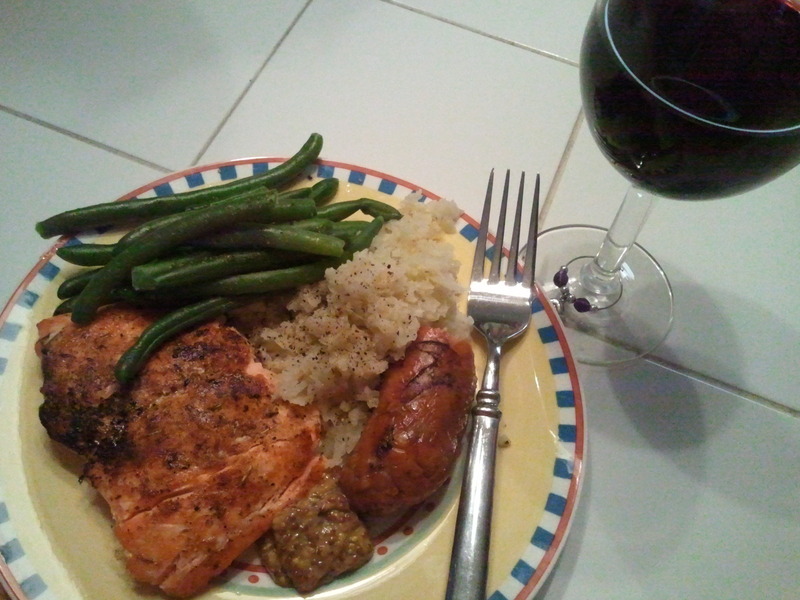 I love cooking and creating recipes. I love being a part of this Blogger community. You guys are great. So that’s what’s new in my life! What’s going on with you?? Stay tuned for lots of updates (including a Blog makeover) coming soon. I need to focus on my studies. Once the semester is over, I’ll be back! Yesterday was Wednesday. So I tried to remember to take photos of my food all day. Thanks to Jenn at Peas and Crayons for hosting this fun link up every week. As I said in my last post, it’s been a really busy week!! I’ve hardly had the time to blog at all. It’s not that I haven’t thought about it. I’ve planned the posts in my head, but finding the time to sit down and write is hard. Too many other things have been taking precedence lately. 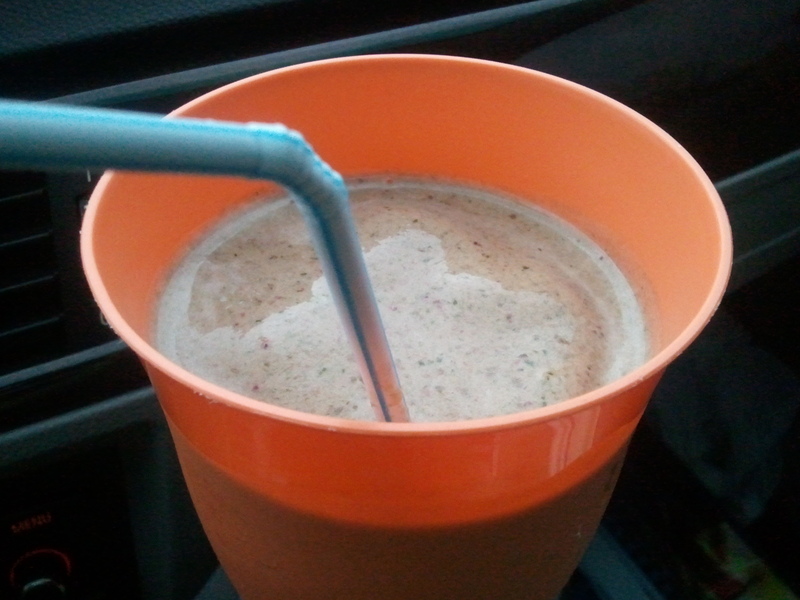 The day started with a kale shake, of course. (I forgot to take a photo, so this is actually an old one)…. Busy day at work!! 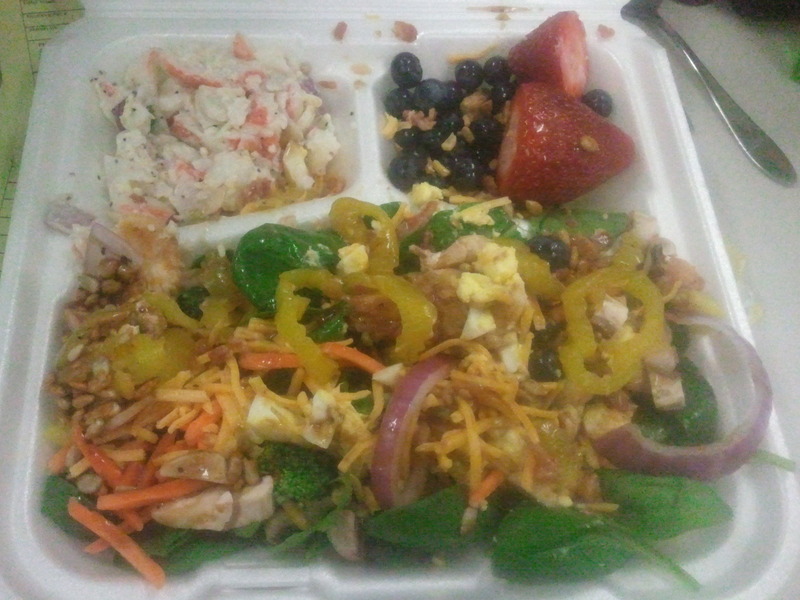 So I hopped over to the Food City across the street to make myself a salad from the salad bar. Apparently there was some shifting during transit. My cheese and sunflower seeds ended up mixed in with my berries. Eh. That’s ok. I ate it anyway. After a busy day at work, I didn’t feel much like cooking. 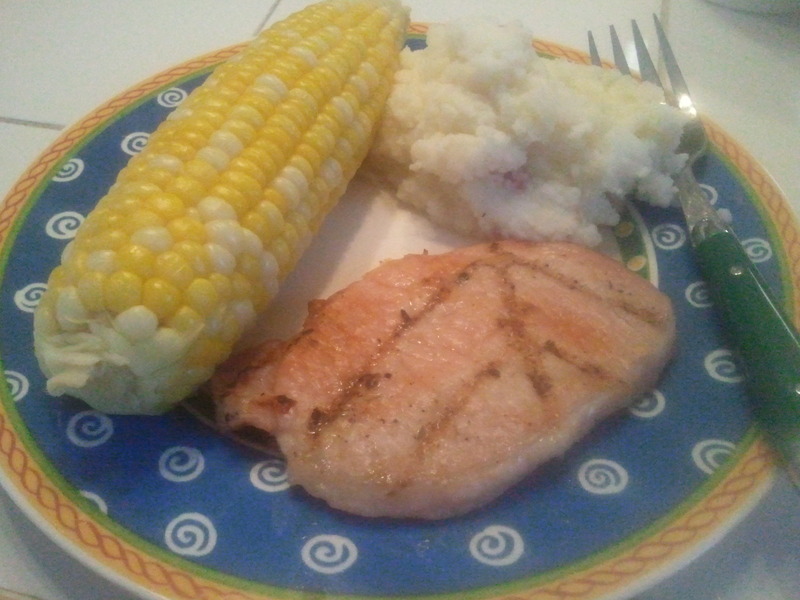 There’s not a whole lot easier than grilled pork chops, corn on the cob and (instant) mashed potatoes. I love the Idahoan kind. (Baby Reds are my fave). They are so easy and really do taste like real mashed potatoes. And of course, I couldn’t resist snapping a photo of the interesting sunset out my window with the sun peeking out behind the storm clouds. 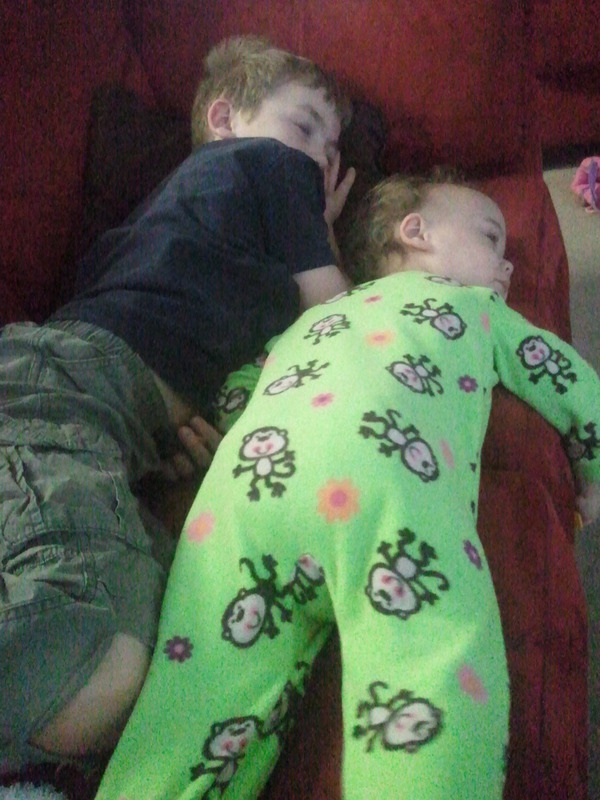 And I’ll throw in a pic of the kids …. 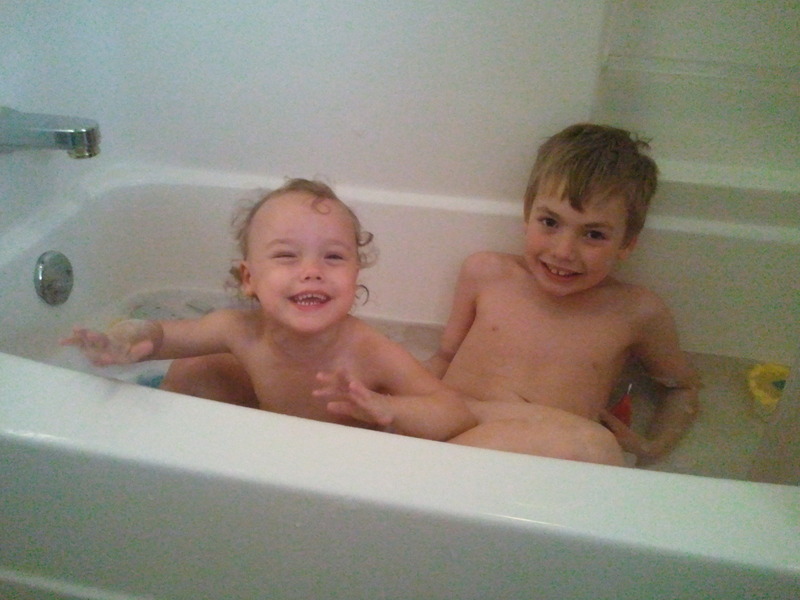 they love bath time…. Oh, and I signed up for another Diet Bet!! I needed a little extra motivation to get my body ready for bikini weather. What I love about Diet Bet is – it’s not on the honor system. 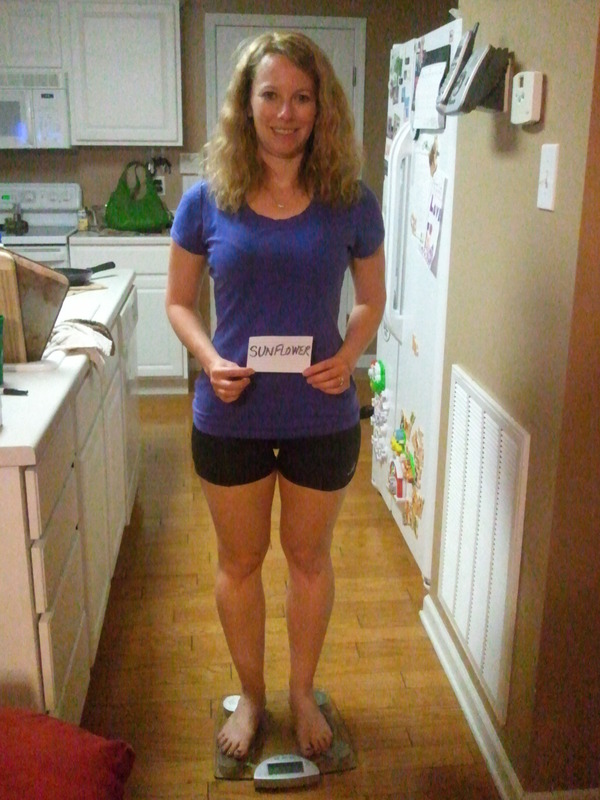 They verify your starting weight and and your final weight with pictures. And they ensure that you are taking a new picture each by giving you a new word to hold. (I thought my word was very fitting …. I love sunflowers)! So I’ve got 28 days to lose 4%! It’s on. Once again, I’m a little late in posting my weekend shenanigans. Better late than never, right?? 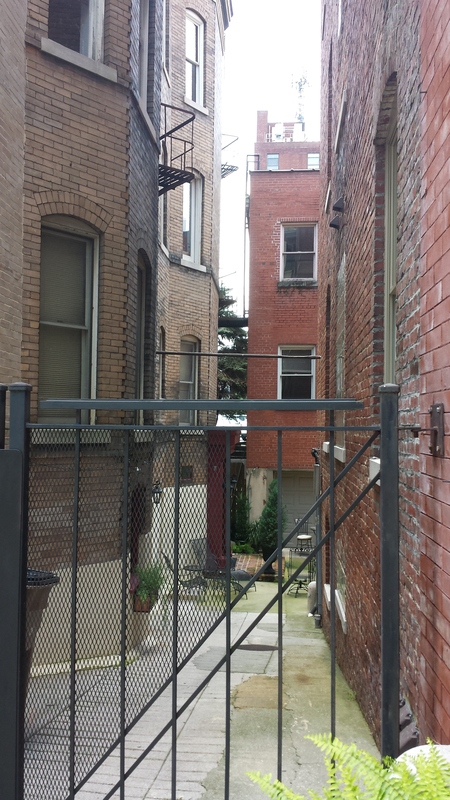 I need to get better at transferring the pictures from the phone to the blog. I always plan out the post in my head, but never have time to follow through the way I want to. But as always happens, if there are things I don’t want to do, I will find a way to put them off. 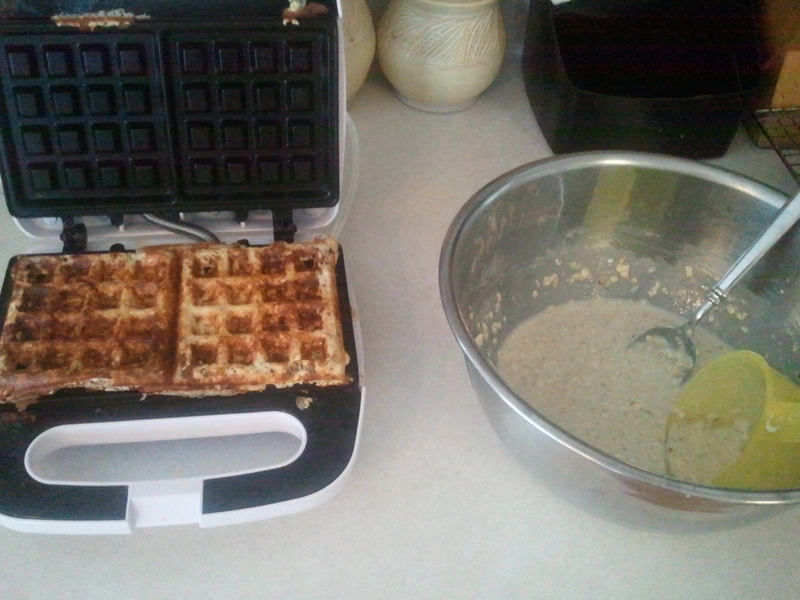 On Saturday morning, I thought waffles were a great way to procrastinate…. 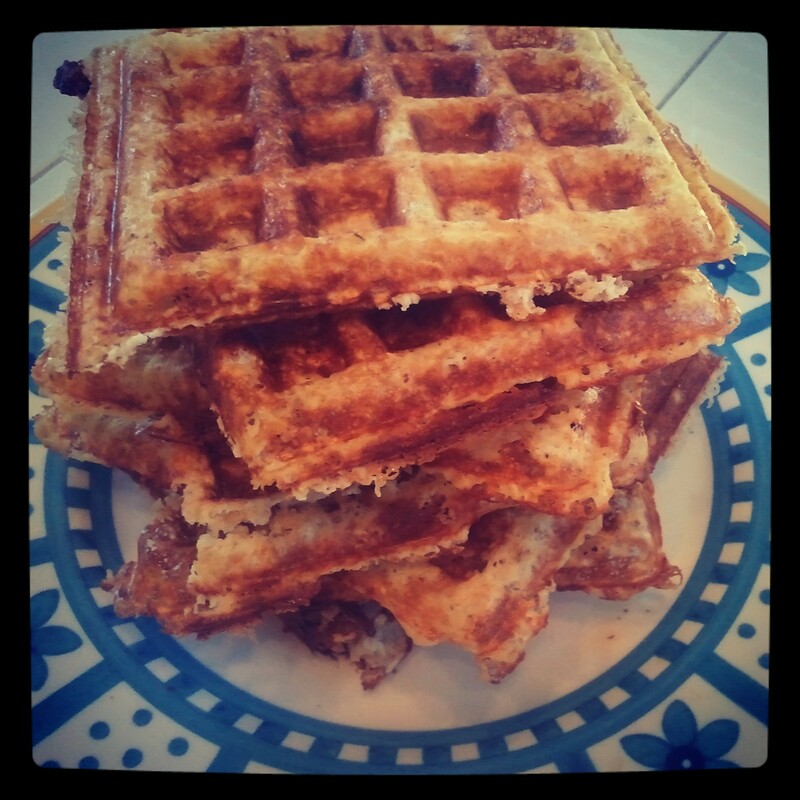 These are Protein Oat Waffles. Don’t get excited and ask me for a recipe. 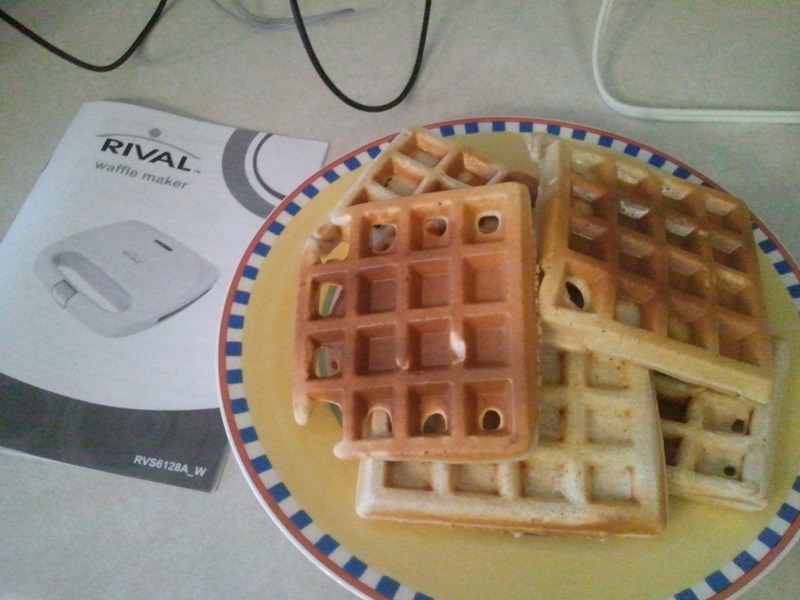 Even though they look pretty, it was a HUGE waffle fail!! I found a recipe for pancakes made with oats. You were supposed to put the oats in a food processor to make them into a fine flour. I skipped that part thinking it wouldn’t matter. Oh, it mattered!! That step was in there for a reason. 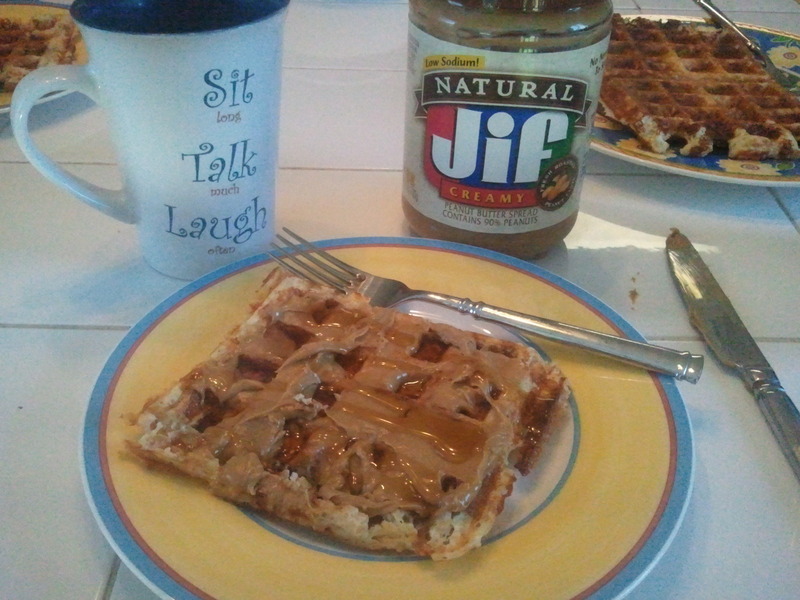 I, of course, still ate mine after I smothered peanut butter all over it. But the hubs and the kids weren’t too crazy about the consistency. Oh well. Back to the waffle drawing board. 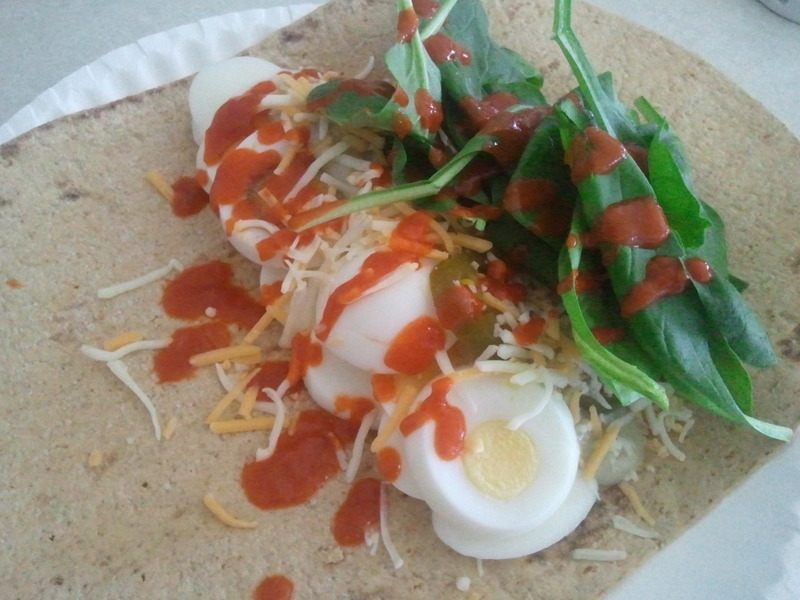 For lunch, I made a hard boiled egg wrap in a Flat Out. 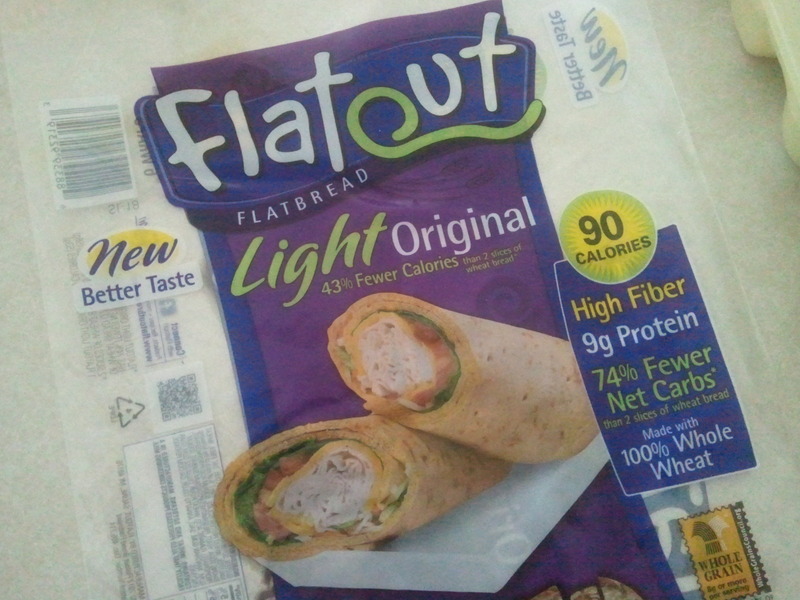 Have you tried these Flat Outs? I love them!! Eventually I ended up taking care of my chores. And to celebrate, Hubby and I went out for a date night. Well, a ‘Not Quite Date Night’. 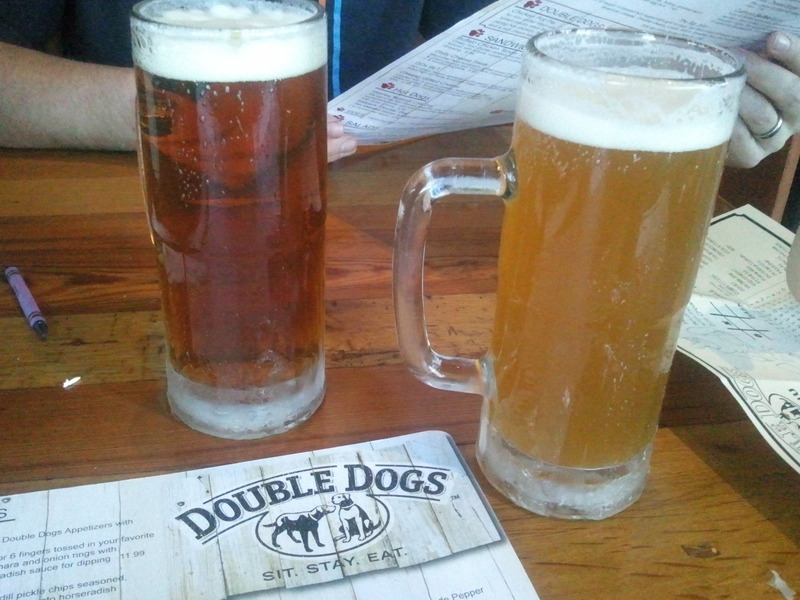 We ventured down the street to a neat little place called Double Dogs. We had to take one kid with us. The other kid was spending the night at my Mom’s house. She prefers to keep them one at a time. And a date night with a little person is not quite a date night. 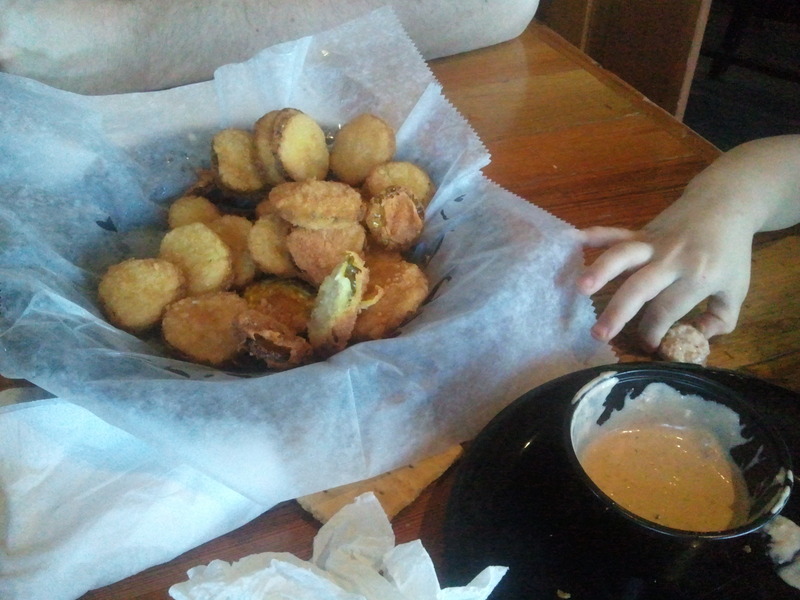 And it meant we had to share our fried pickles with her. And then we had to deal with her fits. 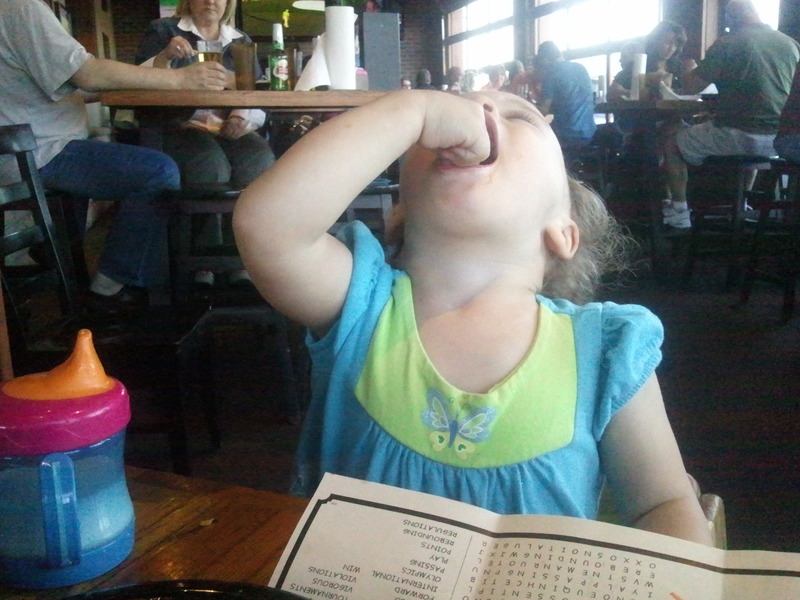 She is definitely a two-year old! 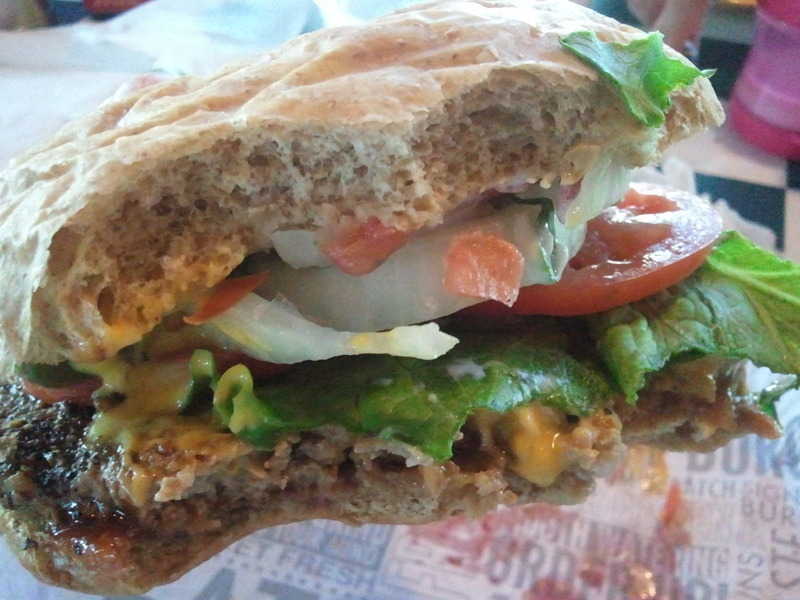 But my California Buffalo Burger was delicious. Here’s the description: A low-fat Buffalo burger patty topped with fresh spinach, tomatoes, red onion, Dijon mustard, our signature lime sour cream and Provolone cheese. 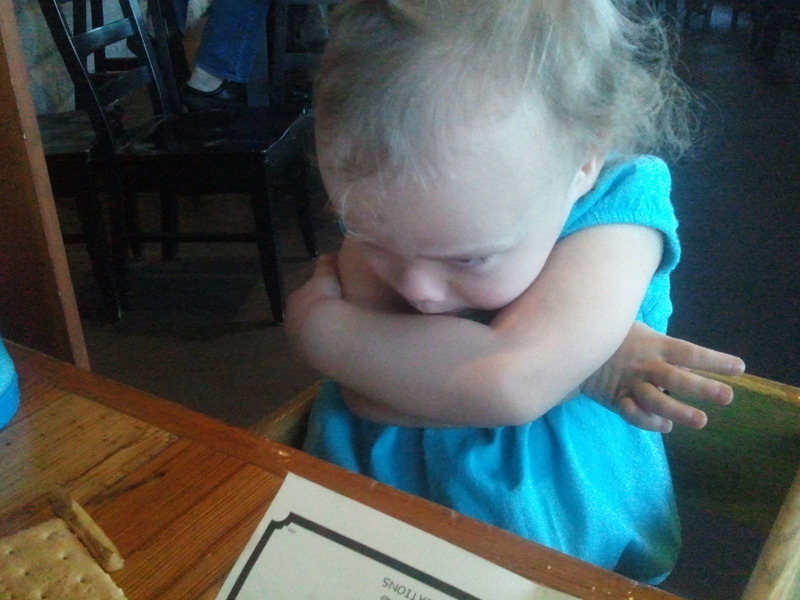 And I shared my fries with the little one. On Sunday I was able to get the taxes prepared, filed and put away!! Yay. That’s always a chore I hate doing. Even if we do get a little money back, I still wait til the last minute to do it because I hate the process so much!! That was what was Marvelous in my Monday …. even though now it’s actually Thursday. Oops. Question of the Day: What chores do you hate doing that you put off?? 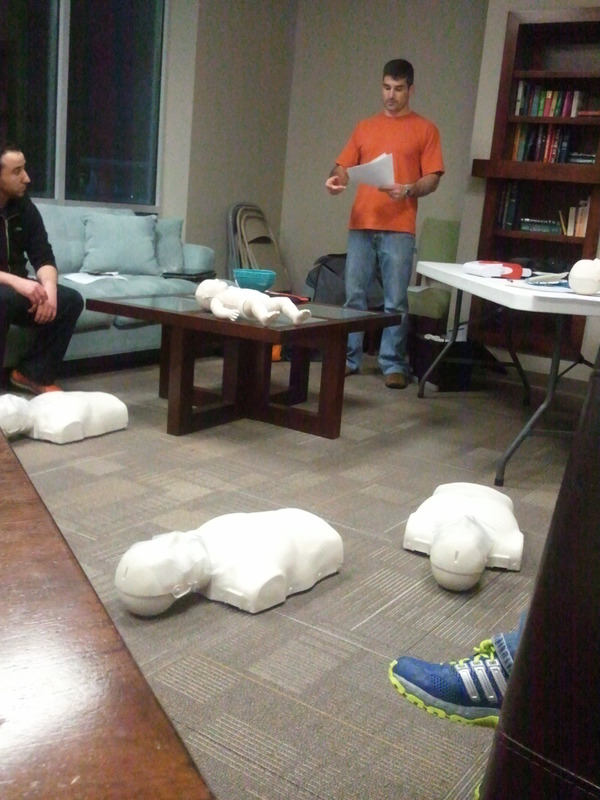 I was really kinda dreading the class, knowing I would have to practice on dummies, but it was fun. 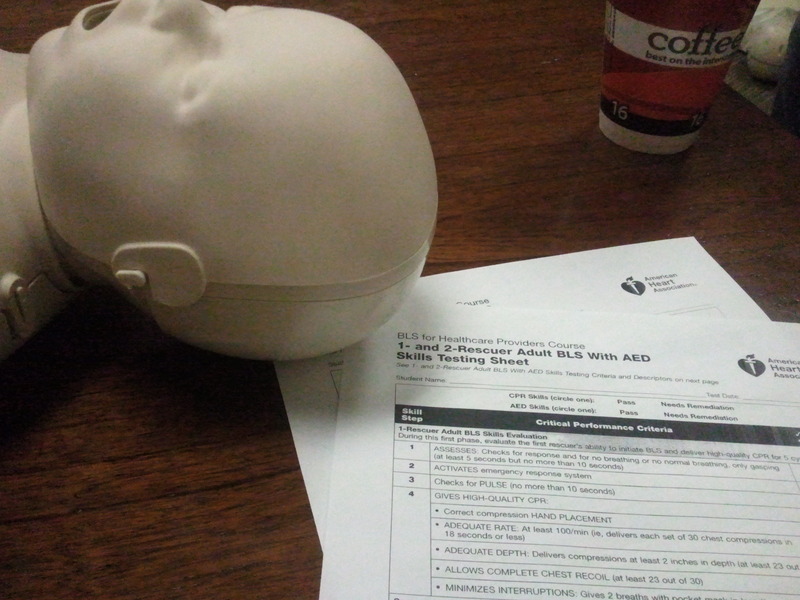 What led me to sign up for the certification class, though, was the fact that when I went to register for my ACE Fitness test, I realized that I couldn’t even register for an exam until I had the CPR certification. I knew I had to be certified before I took the exam, but I didn’t know I had to be certified before I could even register for it. So I panicked. I needed to find the closest class available. I had to wait another 3 weeks before the class was held. I was so afraid that the test spots would fill up in the meantime. I had already missed out on the closest exam date held in Knoxville. I was already going to have to drive to Chattanooga to take the test now. But now that it’s over, I am officially signed up for my ACE Fitness Test. It’s just slightly less than 6 weeks away. 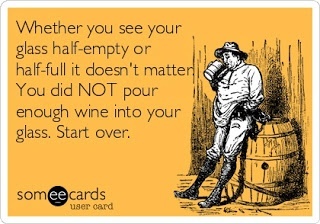 So I better get cracking!!! Do you remember me telling you about the Diet Bet I was doing? Well, Wednesday was the last day. We needed to submit our final weight by midnight. The deal was we had to lose 4% in 4 weeks. And I am very happy to report that both hubby and I made it! I only had to lose roughly 5 pounds, and he needed to lose around 10. That did it. It put me under the goal! Was it cheating? I don’t think so. I also don’t think I should have lost $25 over two-tenths of a pound when I had legitimately lost 4.8 pounds already. Plus, my original weigh-in was at night. So it’s actually only fair that I weigh at the same time of day. Right? One thing I didn’t tell you about the race was that was the FIRST time I ran in my brand new shoes! Yes, it was a huge risk. But I knew if I ran in my old shoes I would definitely get blisters. They give me blisters even on a short run. I knew they wouldn’t last for 13.1. So I visited a local running store a week before the race to get fitted for new shoes. We tried on a number of different brands – Adidas, Asics, Brooks, Saucony, etc. 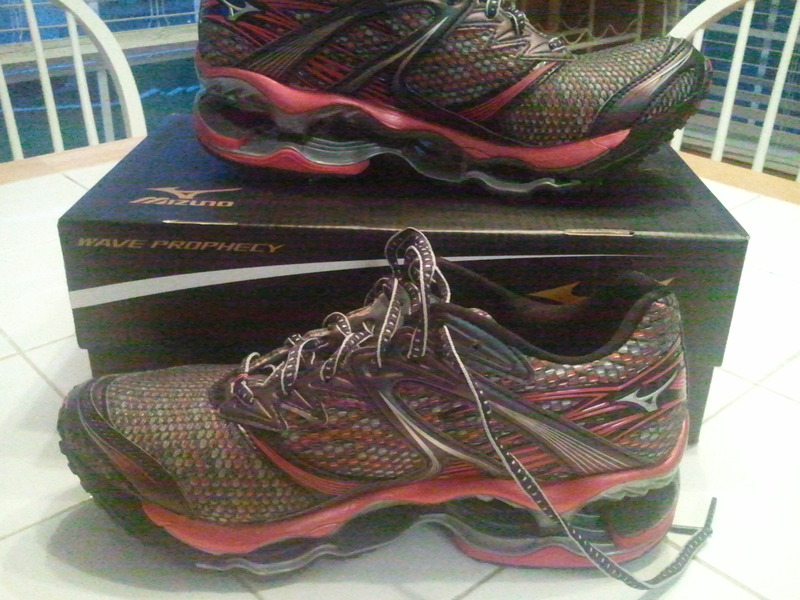 But the minute I put my foot in the Mizuno Wave Prophecy, I knew they were the ones!! I asked the shoe guy if it was crazy to buy a brand new pair of shoes a week before the race. He said not if it’s the right pair! Hmm. Interesting. Well, these were definitely the right pair!! If you’ve never actually had your foot measured and evaluated at a specialty shoe store, I highly recommend it. I’d always just ordered my shoes online. I always ordered a Size 7 because that’s what I wear in every other pair of shoes. 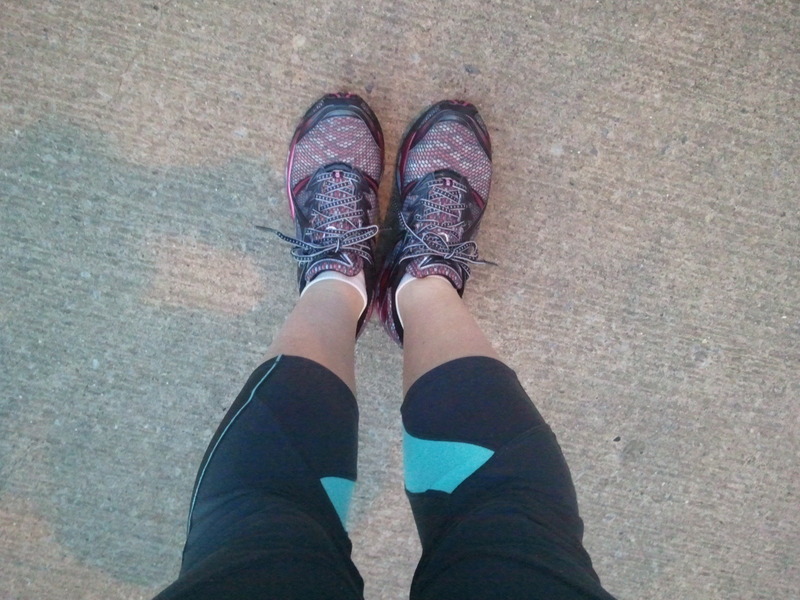 But did you know that you should order a 1/2 size up on a running shoe? I didn’t know that. Part of the problem with the old shoes is that they were too tight!! No wonder they gave me blisters. I also thought I was an overpronator, as most people are. So I would specifically search out the shoes that were good for overpronation. But that was wrong, the shoe guy told me I have a neutral foot. So I needed a neutral shoe. I had no idea!! These are the most expensive shoes I’ve ever purchased! But in my opinion, they were worth every penny. They carried me through the race with no issues. I was also told that these shoes will last twice as long as others because it doesn’t break down. So that’s worth the extra money too. If you have a neutral foot, I highly recommend the Mizuno Wave Prophecy! I think I’ve found my new favorite shoes. Questions of the Day: Have you ever raced in brand new shoes? What is your favorite brand of running shoe?? Well the big day finally arrived, ready or not. And I was not. Well, not as ready as I should have been. I knew I should have been training more, running farther. 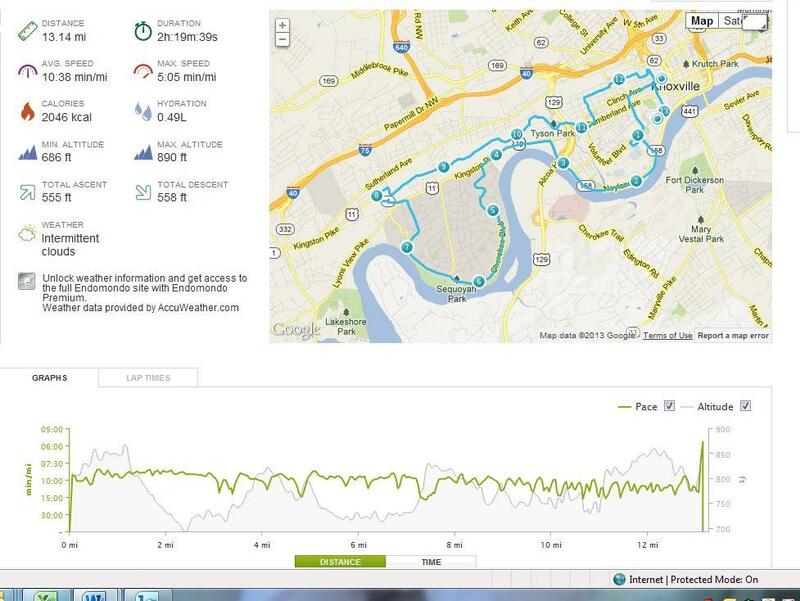 My longest training run prior to the race was 6.5 miles. I had been looking forward to this race for months. I was determined not to let the lack of training or this sinus congestion keep me out of the race. So I got up early, took my Mucinex-D before the race (which did not help at all), ate my oatmeal, and drank 1/2 cup of coffee. I left the house around 6:40am to drive downtown. I had a couple of friends who were also running the race, but we just agreed to meet in the corral. 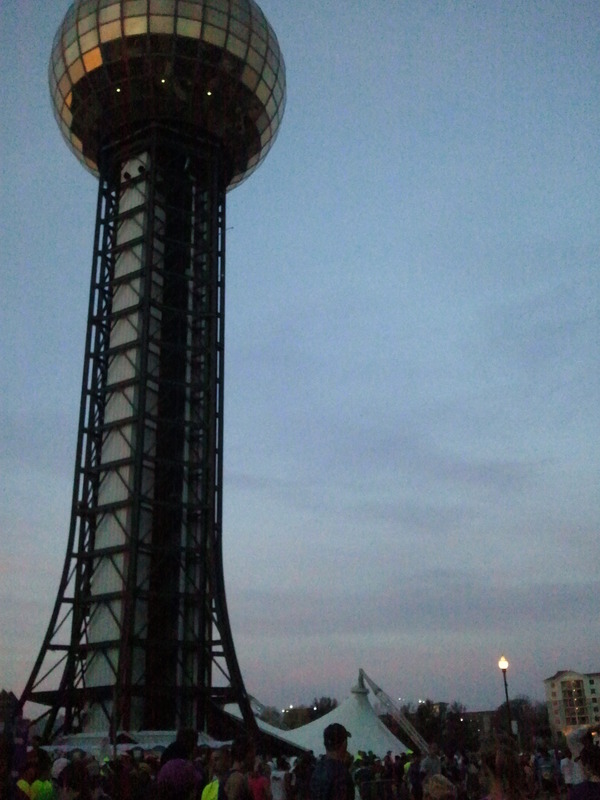 The race started at 7:30am in downtown Knoxville, next to the famous Sunsphere. 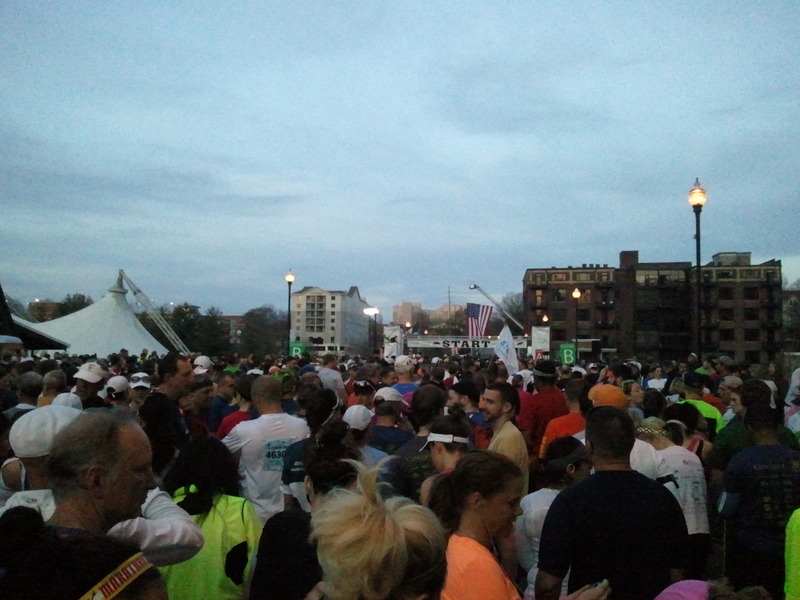 There were over 5,000 people there for 3 different races – 5k, Half and Full Marathon. The weather was PERFECT! In years past, it’s usually cold and foggy or drizzly, but this year it could not have been more perfect! It started out at 56 degrees and only improved from there. 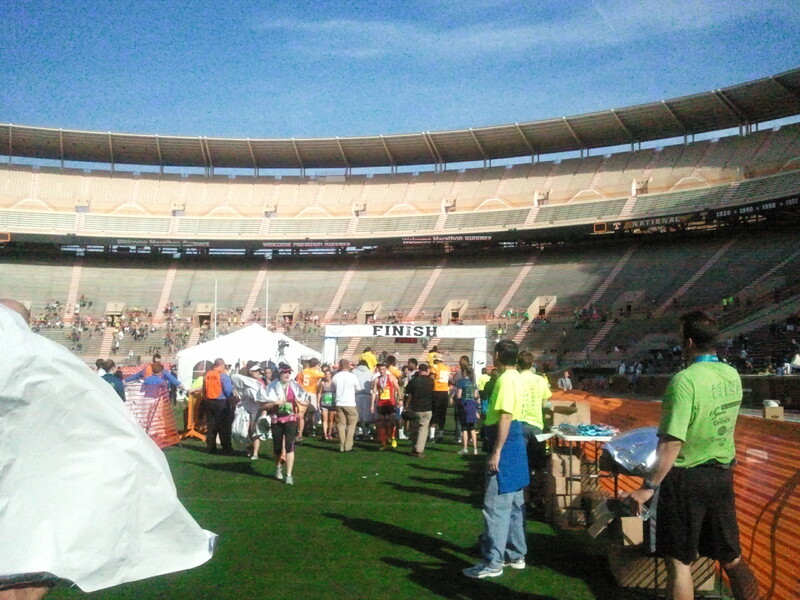 The first 3 miles went great as we wound through campus onto Neyland Drive. 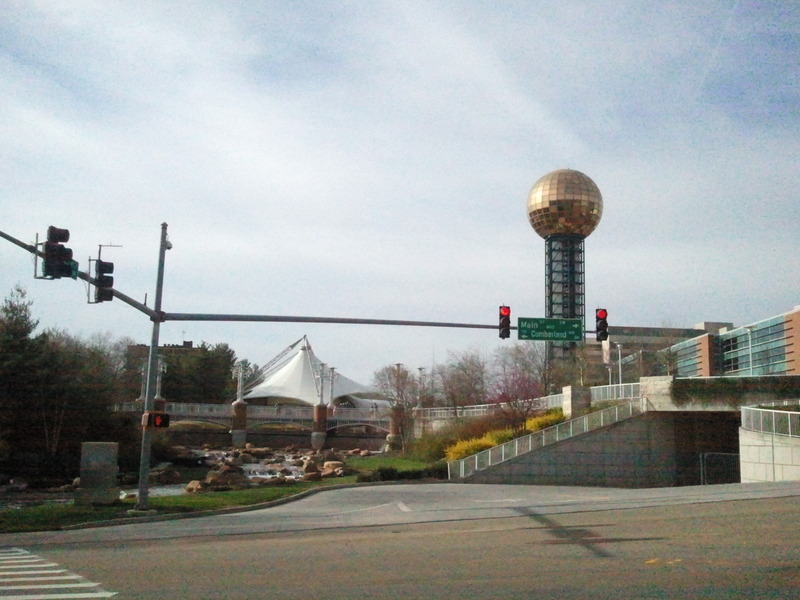 Just after turning left on Kingston Pike, I took a quick bathroom break. There was a short line and I knew if I didn’t go then, the line would be longer at the next one. 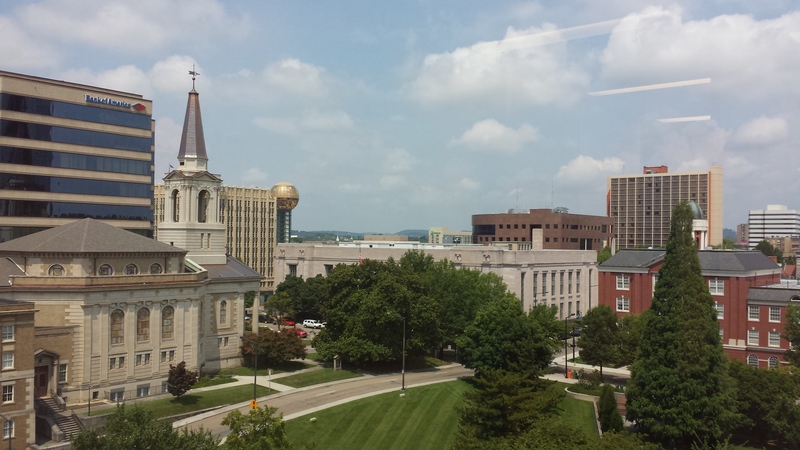 I was feeling really good as we turned into Sequoyah Hills and ran the length of Cherokee Blvd. I was happy with my 10k time at 1:01. The 7-mile mark is just at the base of the Noelton Drive hill. 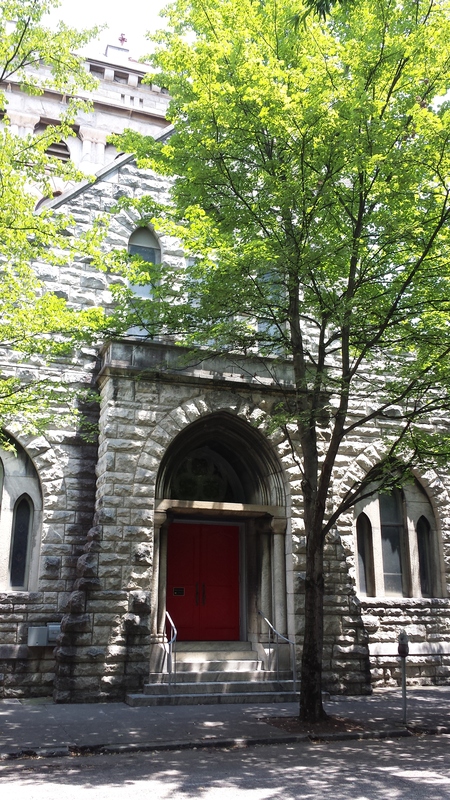 Imagine the tallest, steepest hill you’ve ever seen, and this one is taller and steeper. My strategy going in was to walk the hill. I even ate my GU while I walked up the hill. Sure I could have run it, but then I would have worn myself out and there’s still 6 more miles to go after that! 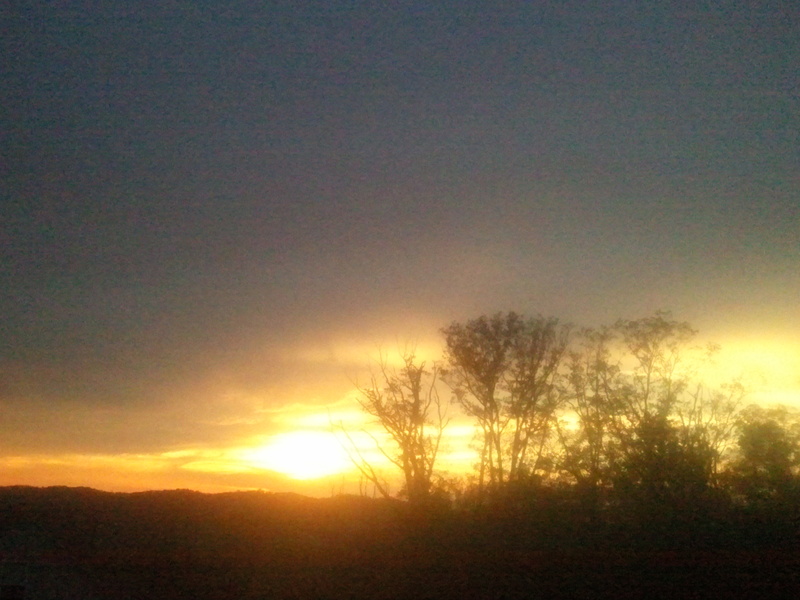 I felt a jolt of energy at the top of Noelton Drive, as we turned left onto Kingston Pike. I don’t know if it was the screaming crowd of people or the GU kicking in, but I got my second wind. I was still feeling good as we entered the Third Creek Greenway, and when I saw the sign for 9 miles, I thought it was wrong. I didn’t think I had gone that far yet. I started smiling. Only 4 more miles left. And then WHAM! I hit the wall. Around the 10-mile mark, my knee joints were killing me. I feared my IT band would start flaring up as it has in the past. I just kept pushing through, but stopping to walk more frequently than I wanted to. Those last 3 miles were pure HELL. I even stopped looking at my watch. I was no longer concerned about my time. Going into the race, I wasn’t expecting to PR. But I secretly wanted to try for it. At this point, though, I just wanted to finish. I just wanted this race to be over. Why did I think I could run 13.1 miles when I haven’t trained more than 6.5?????? And then I could see the stadium in my sights. There is no better feeling than crossing the finish line of a race! 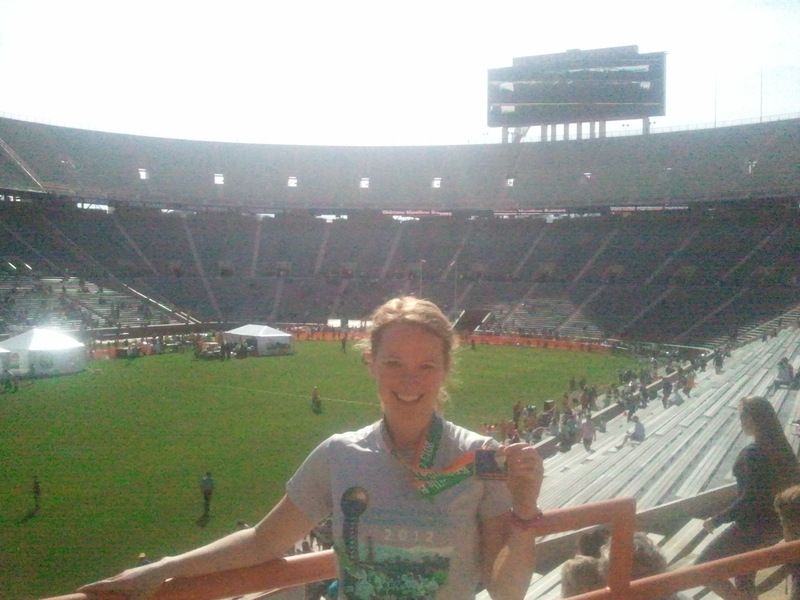 And this race ends on the 50-yard line of Neyland Stadium at the University of Tennessee! I’ve been in those stands many times, so it’s an awesome feeling to be on the field after such an accomplishment. Only 3 minutes behind last year’s time. How is that possible?? Now I’m thinking – just imagine if I’d pushed a little harder on those last 3 miles. Just imagine if I’d had a few training runs at 8 or 10 miles. 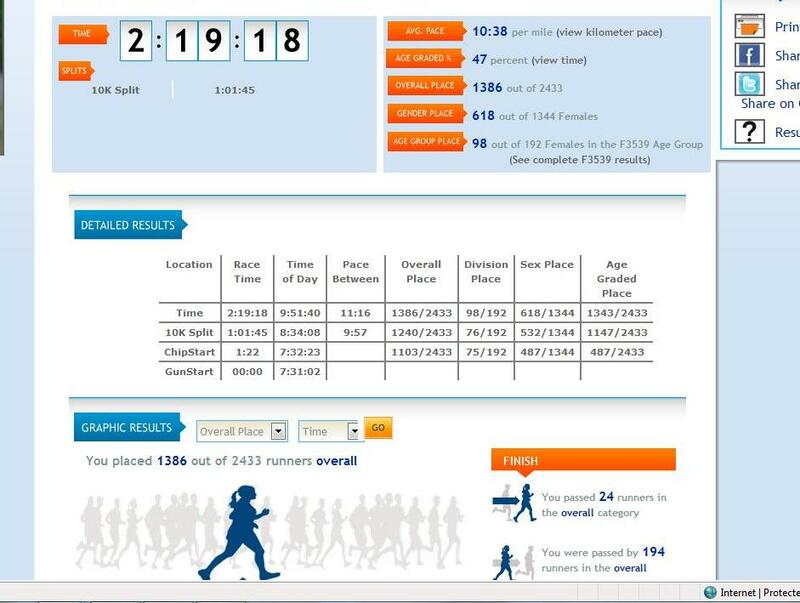 With a tiny bit of additional effort, I could have beat last year’s time. So then I started wondering …. when’s the next race?? How soon can I try this again? I’m always curious about what people are listening to while they run. And I’m amazed at the number of people who didn’t have headphones at all. For a short run, I usually let my mind wander and think about the things on my To Do list. But for a long run, the only thing getting me through it is my music. Yes, I realize it’s a WIDE range there. Rock, Country, Metal, Rap. But they all motivate me in one way or the other. I made sure the harder rock songs kicked in around mile 7, which is when I would need a little more motivation. I timed it almost perfectly. Eminem sang to me during the home stretch, but then the playlist started back at the beginning and The Delta Saints brought me home. 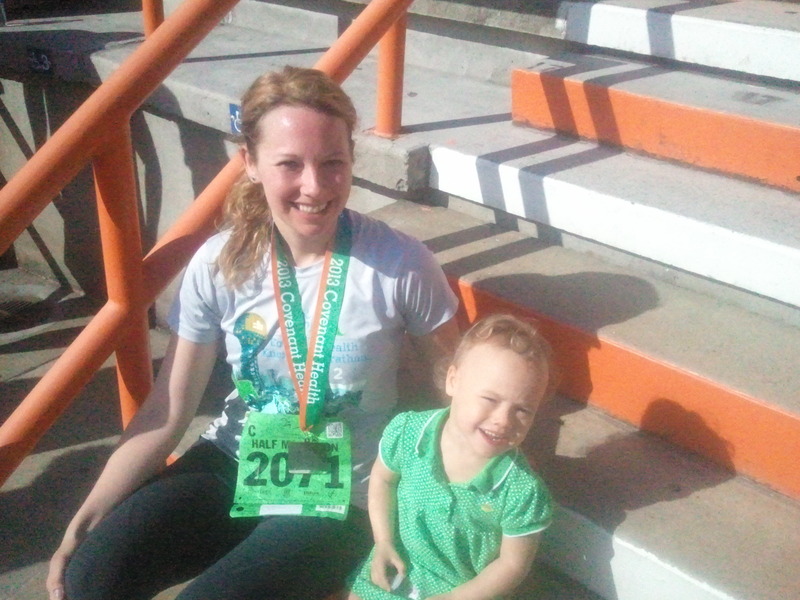 I was so glad hubby was there to watch me cross the finish line. And I don’t know if Little Bit understood what I had just accomplished but she seemed really excited for me. 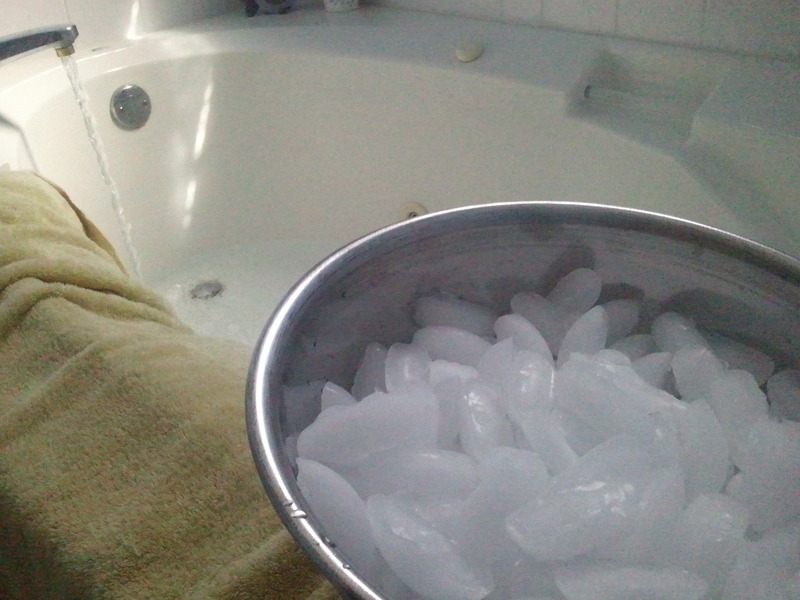 As soon as I got home, I knew the best thing for me was an ice bath. No, it doesn’t feel good. For dinner, we met my Mom, Aunt and Cousin at the Cracker Barrel. 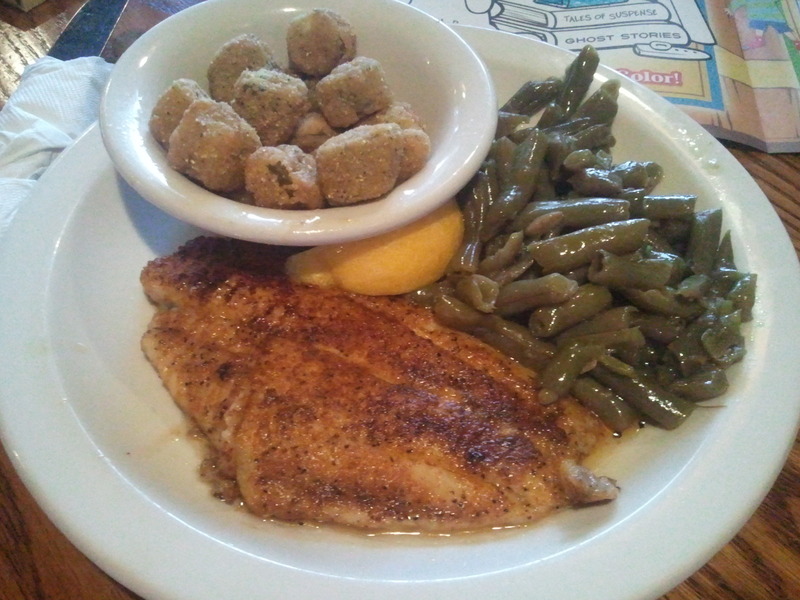 My post-race dinner included spicy grilled catfish, fried okra and green beans. YUM!!! And now that I write this 3 days later, I’m feeling really good. I was really stiff the day after, but the DOMS are completely gone now. Might even go for a run tonight. (In the 85 degree weather)! Question of the Day: Which race should I do next???? 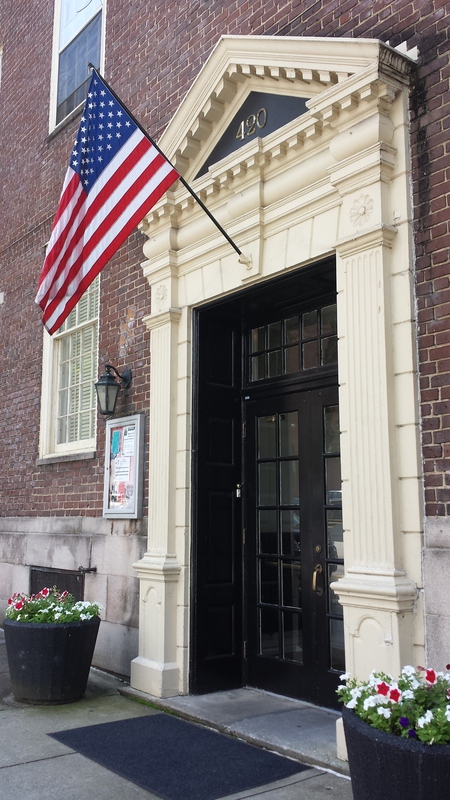 Wow – has it really been 3 weeks since I posted??? Sorry, guys. Life has gotten so crazy lately. Plus, the germs have been running rampant in my house. Hubby is just now getting over a virus he’s had over 2 weeks!! I managed to get the crud, too, just before the big race. (I’ll get to that later). I’ve been taking pictures and constructing blog posts in my head, they just never made it to the computer screen. In fact, when I logged in just now, I realized that I had 3 working drafts for 3 different posts that I never finished. Oops. Part of the problem, though, is that when the pictures don’t upload quickly or WordPress is being difficult, I just walk away. 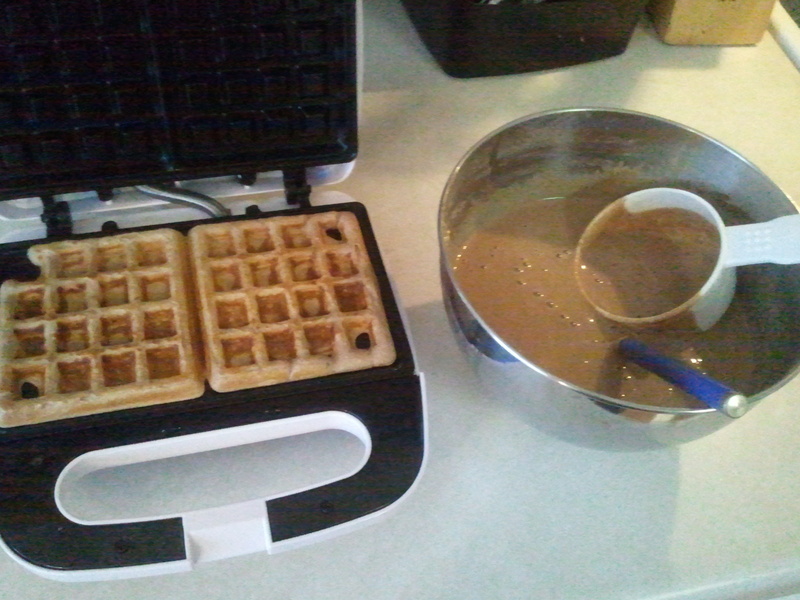 One thing I’ve been doing every weekend is making protein waffles!! 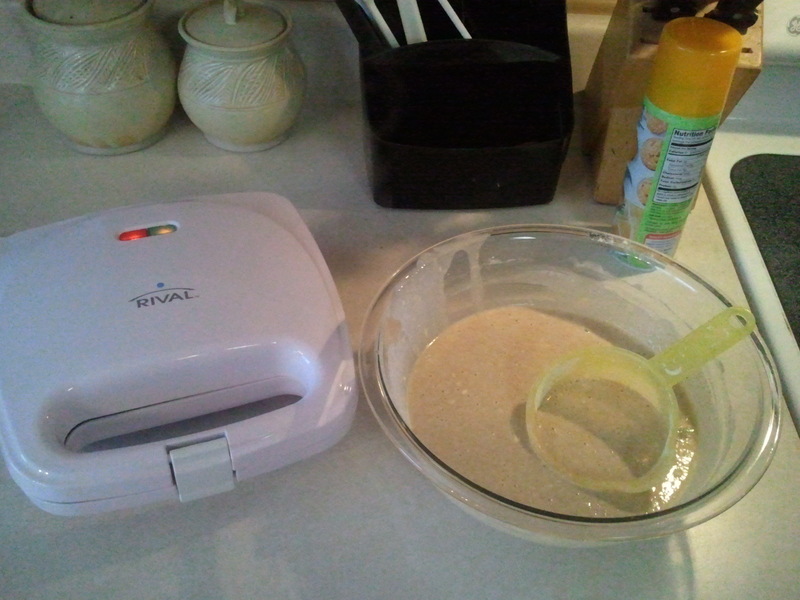 The kids love waffles, but I hate buying the frozen kind with sketch ingredients. So I’ve been having fun with some recipe testing! Once I perfect the recipe, I’ll post it. The first batch was vanilla, and the second batch used chocolate protein powder! Yum! 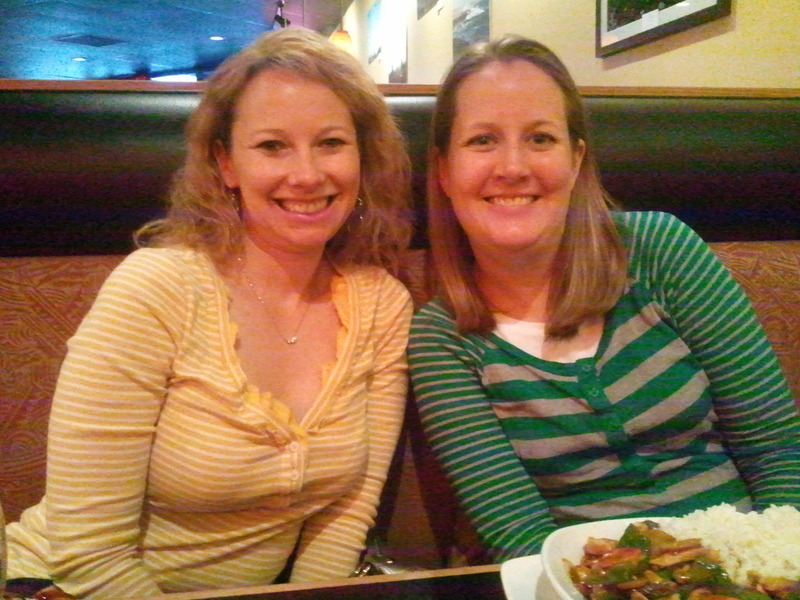 I did enjoy a Girls Night Out one weekend! 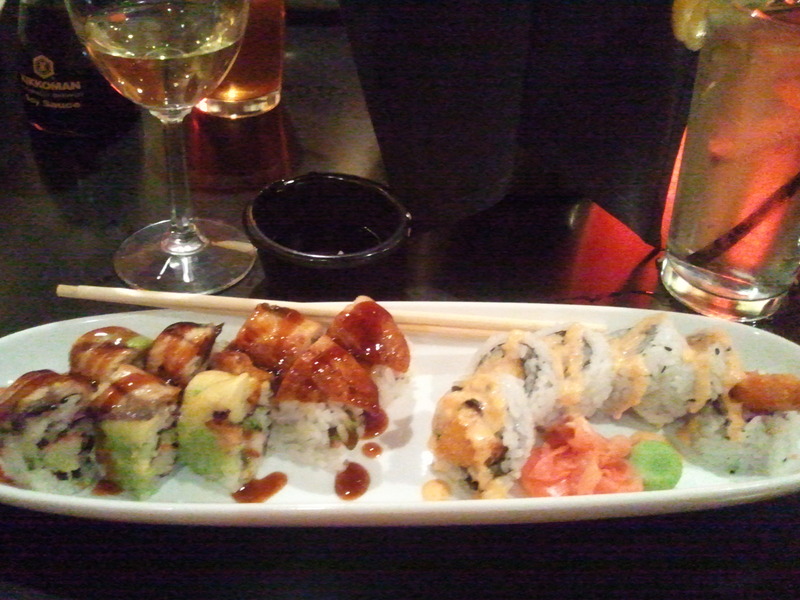 Half price sushi and $10 off bottle of wine at the Stir Fry Cafe on Saturdays! Gotta love that!! 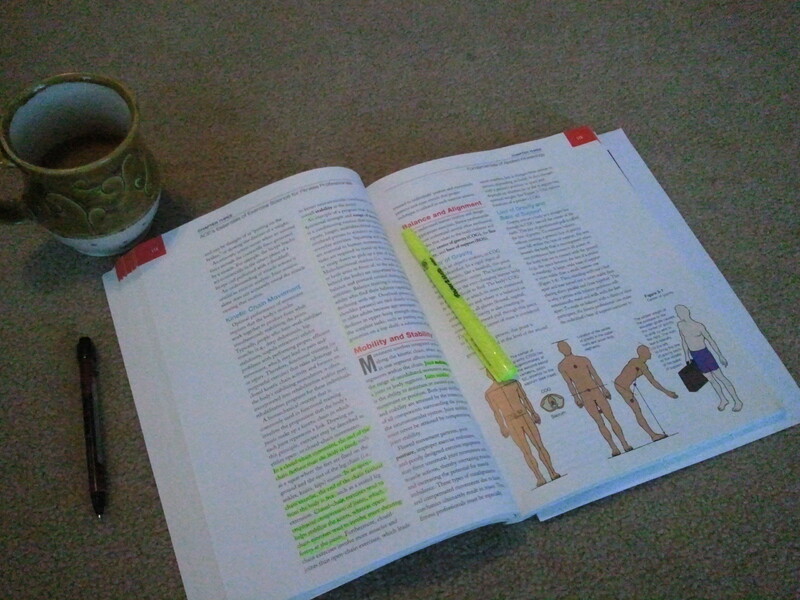 My weekends have mostly consisted of a lot of studying …..
… And eating!! 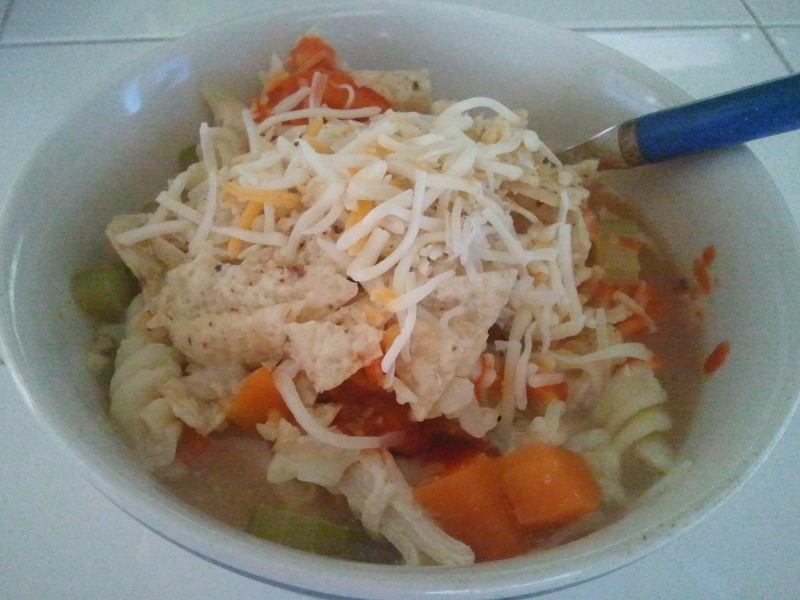 Since everyone in the house was sick, I made a pot of Chicken Noodle Soup, which lasted for days. I love salmon. It might be my favorite food. I also attempted to make mashed cauliflower, but it didn’t turn out so “mashed”. It looks like rice on the plate. 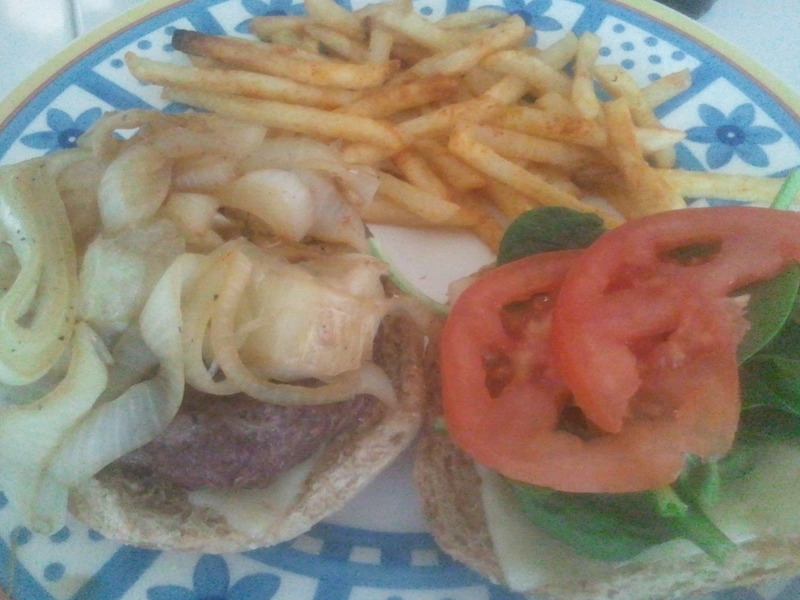 But with a little garlic, salt and pepper, it tasted pretty good. 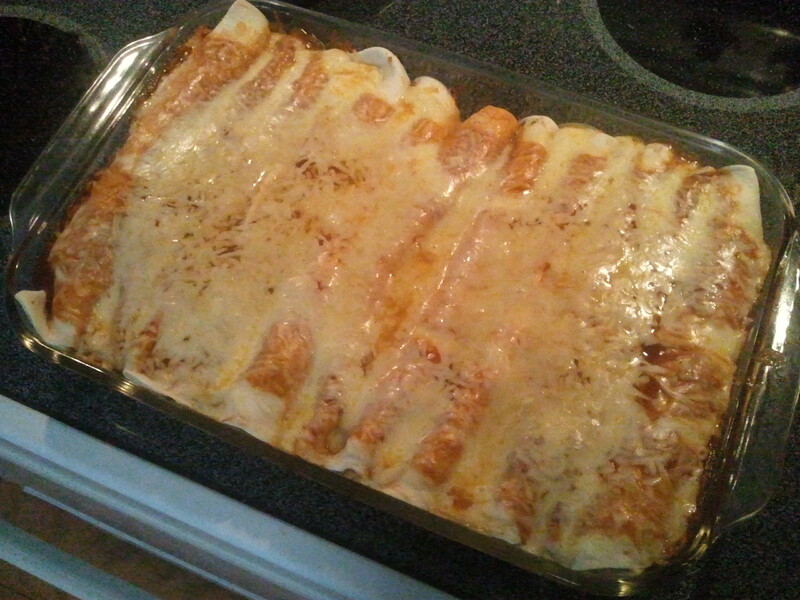 Homemade Chicken/Black Bean/Spinach Enchiladas. Even the kids devour these. A pan like this lasts for days. 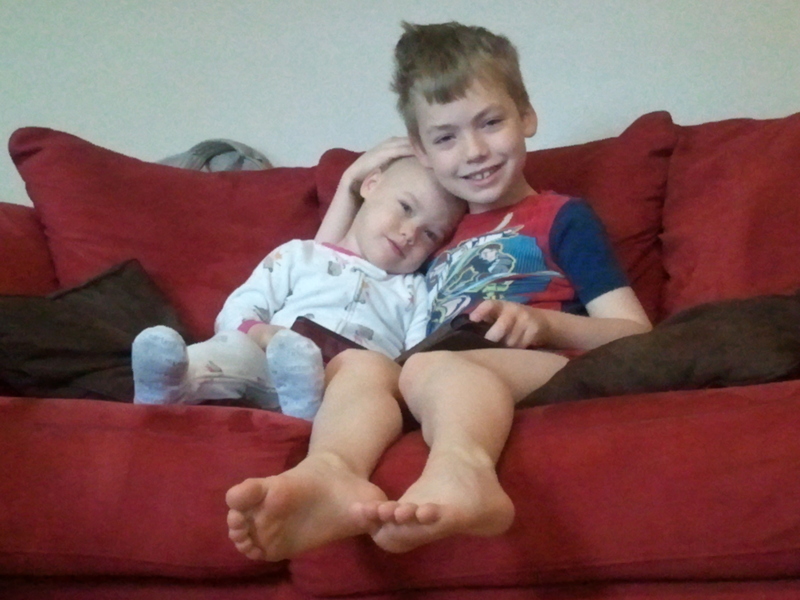 Being sick meant we spent a lot of time on the couch…. …. watching movies together…. We watched ‘Wreck It Ralph’ (twice! ), ‘Hotel Transylvania’, and some other random Redbox find that wasn’t that good. 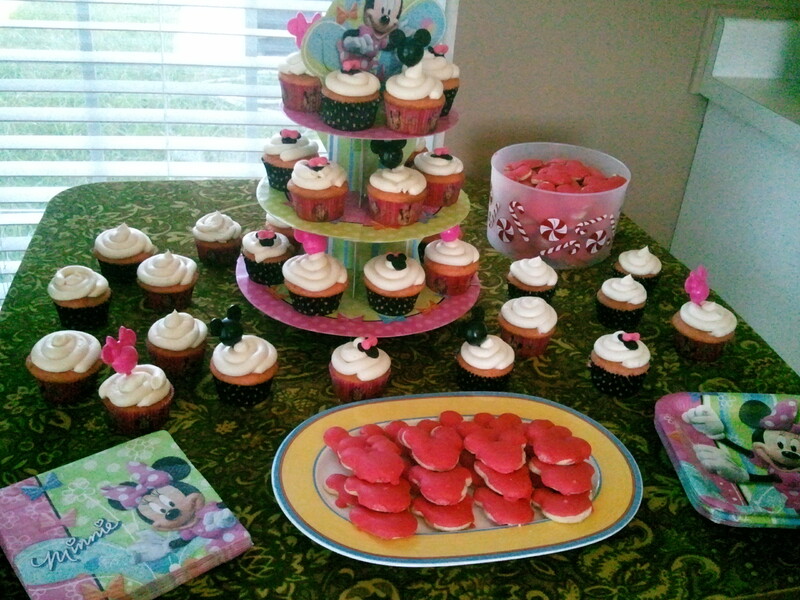 But THIS weekend in particular, I was getting ready for my Half Marathon…. 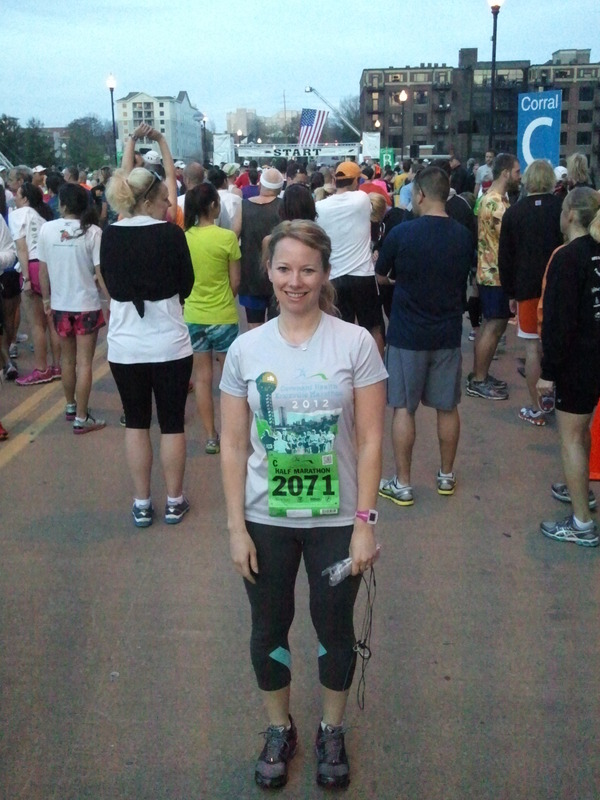 I woke up on Monday with horrible sinus congestion, but I was determined not to let it stop me from running the race. So I asked all my FB friends what their best remedy for nasal congestion was. 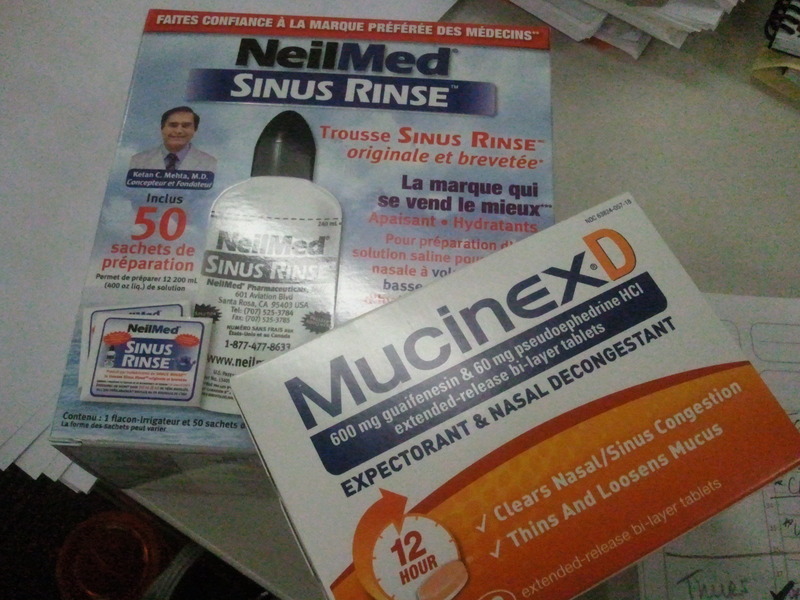 Half said Mucinex D and the other half said a neti pot. So, I decided to do both!! That Mucinex D really works!! It didn’t completely dry me up, but enough where I didn’t feel like my head was in the clouds. 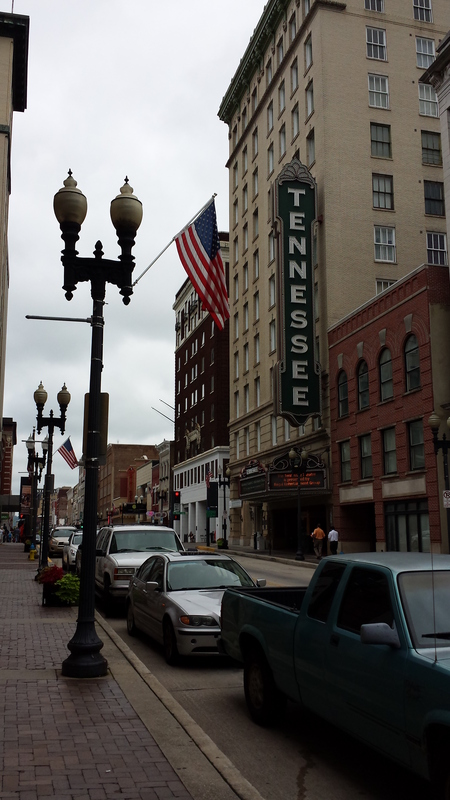 So Saturday, we headed downtown to pick up my race paket from the Expo….. I was starting to get a little nervous. 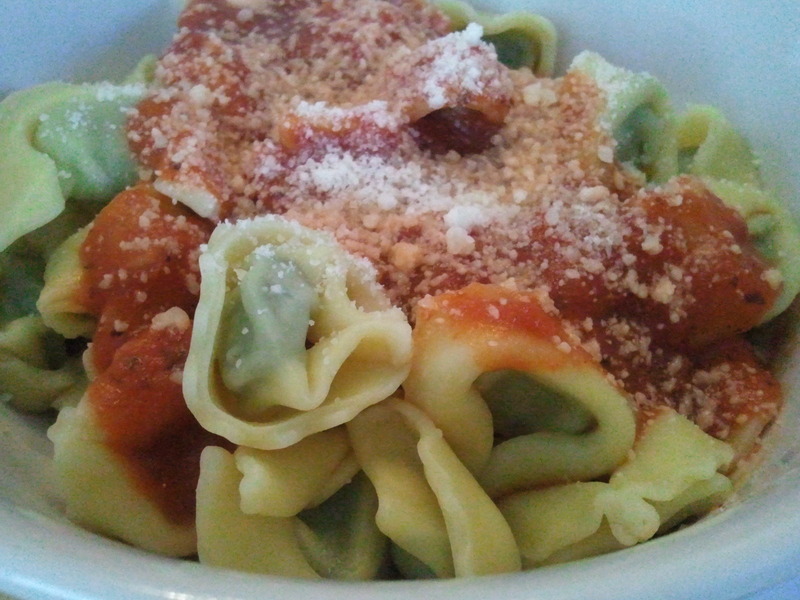 I chose Trader Joe’s spinach tortellini as my carb-loading pre-race meal. Yum. Here’s the starting line…. The temperature was 54 degrees. It was the perfect day! I was hoping and praying my new shoes would carry me to the finish line! Yes, I said BRAND NEW shoes! I know that’s totally crazy, but that’s just how I roll. 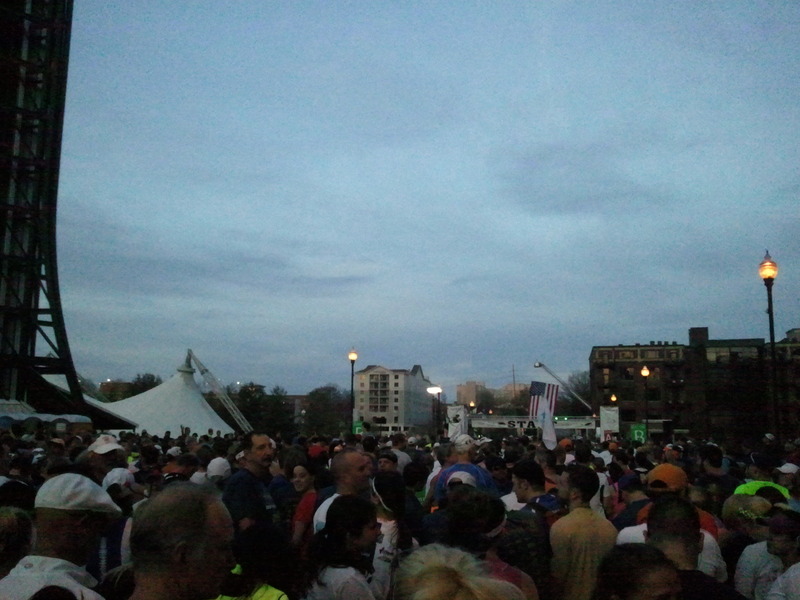 And after the race ….. boy, was I glad it was over. The first 10 miles were awesome, and the last 3 were pure hell. But I made it, congestion and all. And only 3 minutes behind last year’s PR! Final chip time: 2:19:18. I’ll take it. Stay tuned for the details. It was a GREAT race. I’m already wondering when my next one will be! So that’s what’s marvelous in my Monday.